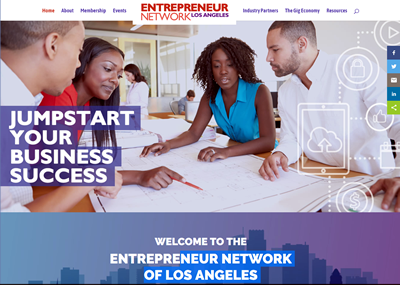 Los Angeles Southwest College sponsored a student-focused Career Expo with speakers, workshops, and presentations. 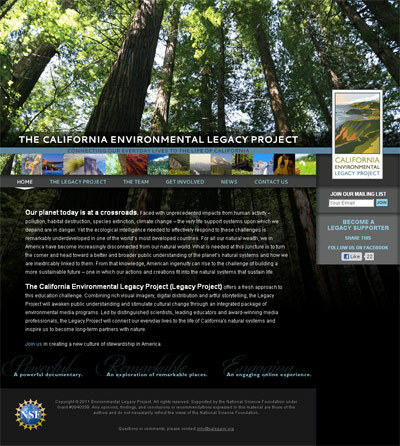 Zumwinkle.com branded the WordPress site and print materials with dynamic visuals under a tight deadline. 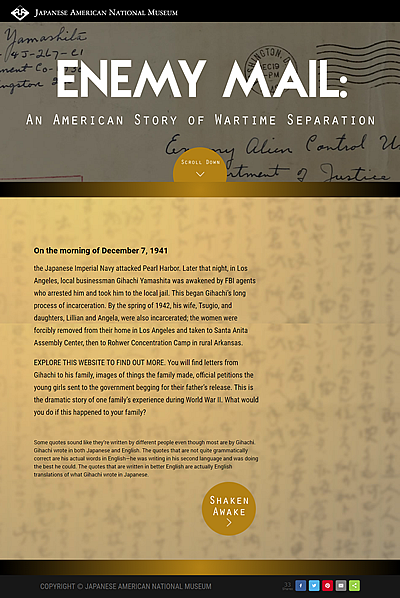 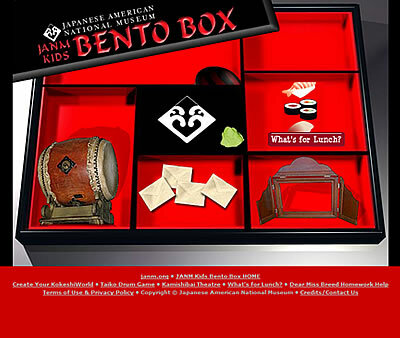 We worked closely with the Japanese American National Museum to present this poetic story about a Japanese-American family during WWII, programmed for a middle-school audience. 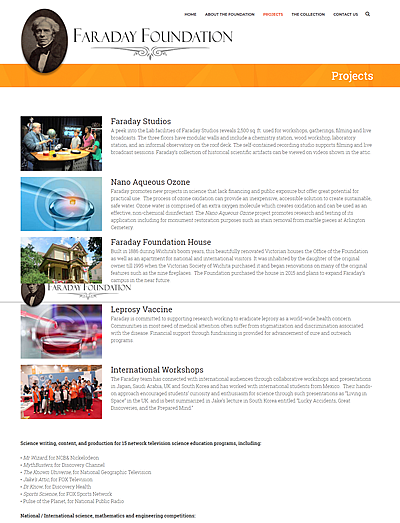 We assisted with content selection and editorial organization, and designed and developed this WordPress site that includes dynamic questions and answers, resources, and a timeline map. 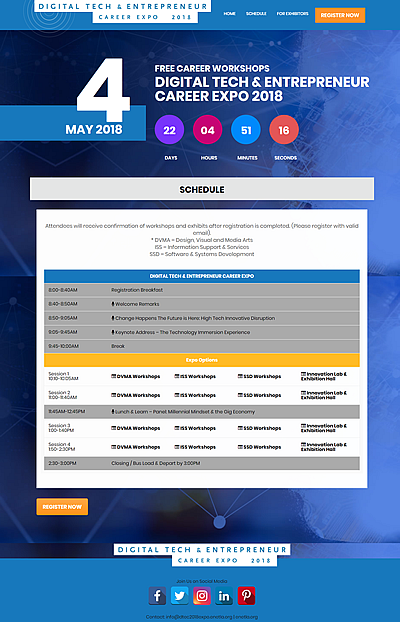 Listen to the voice of experience at experiencetalks.org. 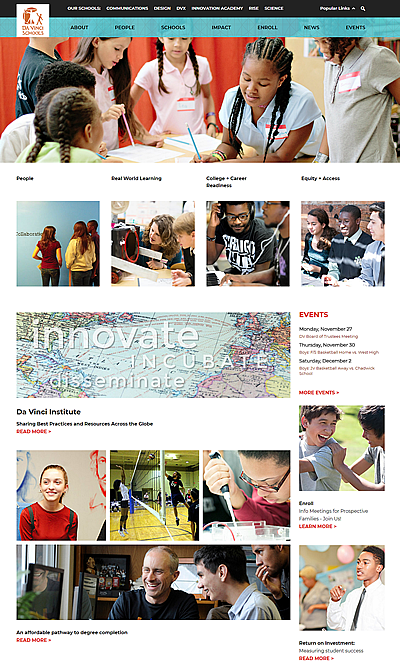 To create a new web site for Los Angeles City College, we conducted extensive user testing through surveys and focus groups, which informed our visual and architecture site redesign. 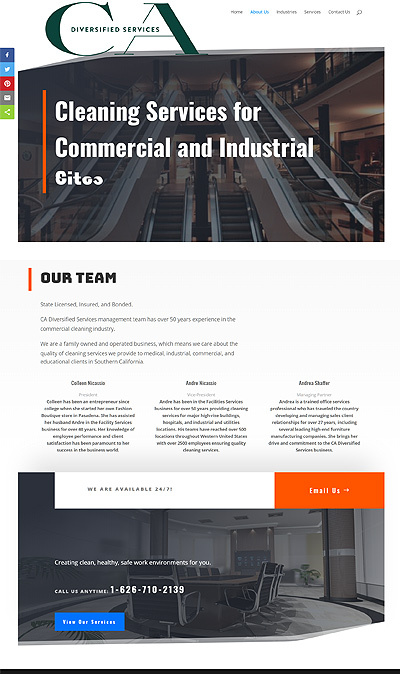 We coordinated the migration and editing of thousands of previous content pages into robust templates within a new Kentico CMS framework. 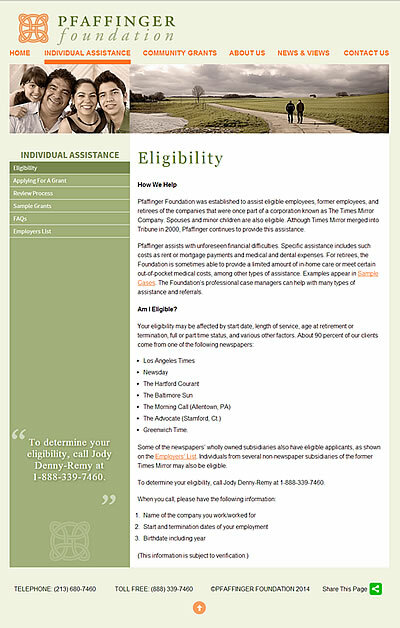 We assisted the building of a complex information architecture to support the needs of 90+ academic and administrative departments, including Section 508 accessibility compliance requirements. 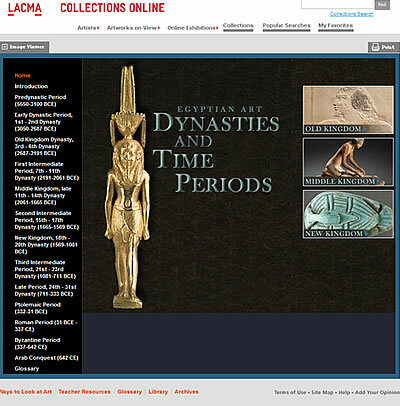 Our production team worked one-to-one with designated LACC department editors in creating new content and media, editing archival resources, and provided training and documentation support in the form of on-site workshops and how-to manuals. 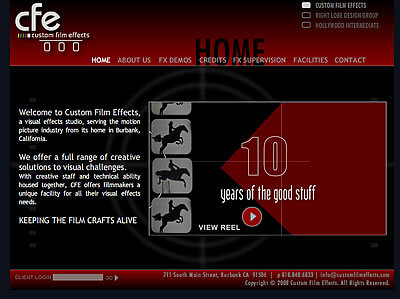 We also provided on-location photographic services. 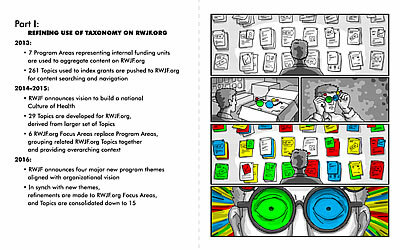 We illustrated and published a print poster and a booklet handout in comic book format for this client’s conference marketing materials. 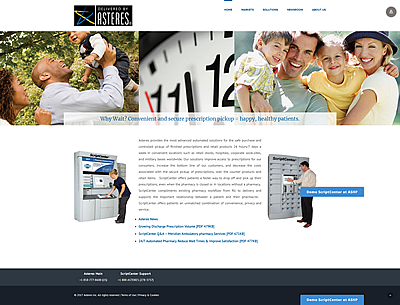 Working with their contracted designer, we provided a practical WordPress site for a medical prescriptions delivery business. 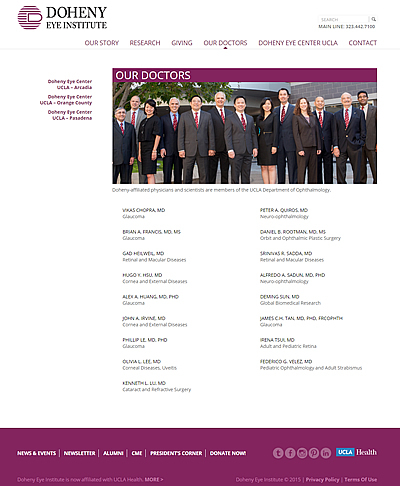 Fill your prescription at Asteres.com. 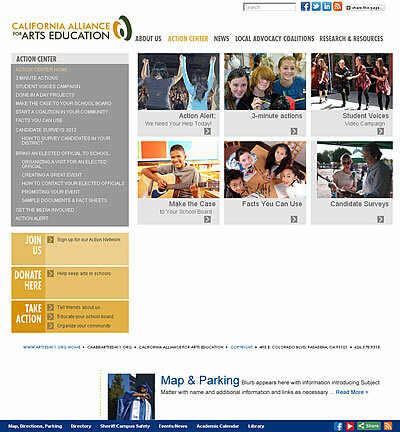 The Educational Student Tours organization needed a new WordPress site with complex eCommerce bookings that includes subscription payment features, customized registration, customer tracking and custom notifications. 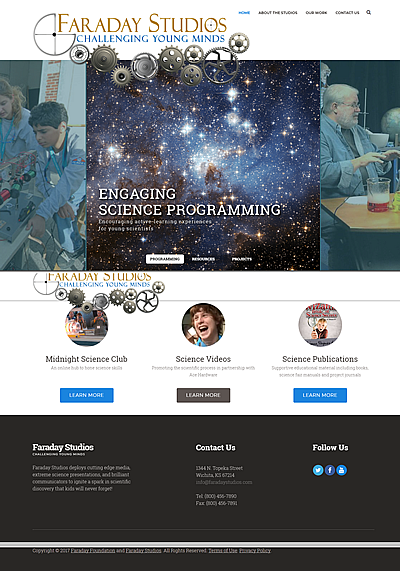 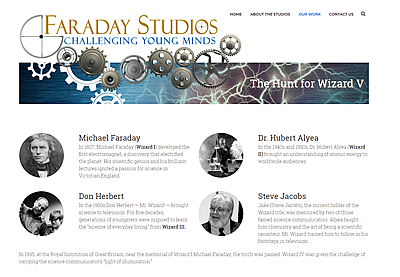 Our client Faraday Foundation offers on-line science activities as a non-profit organization promoting science education communities. 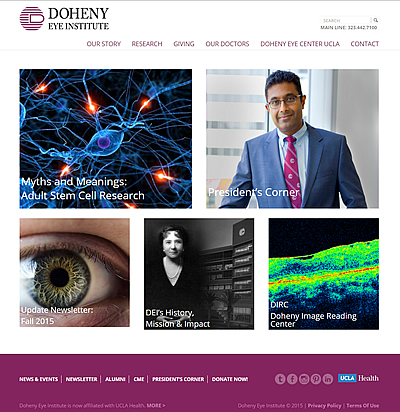 We were excited to be part of the ground floor creation of two new WordPress sites which required strong web architecture design, and included full editorial and SEO and SEM services. 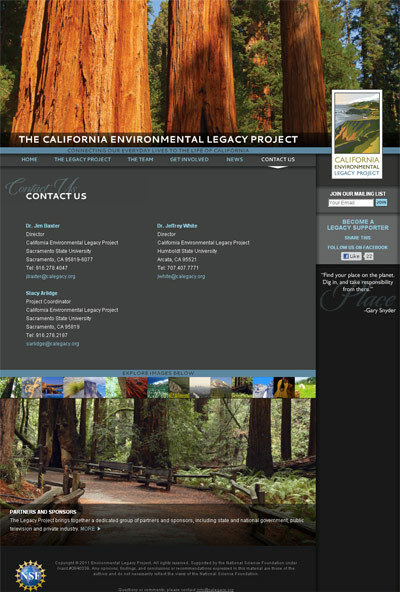 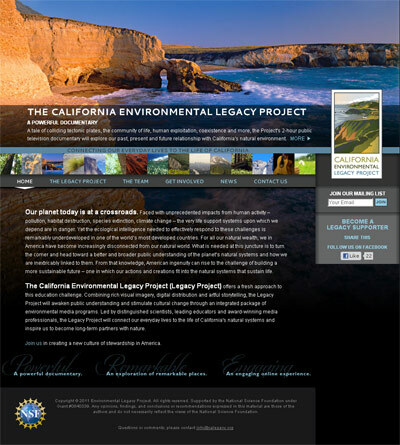 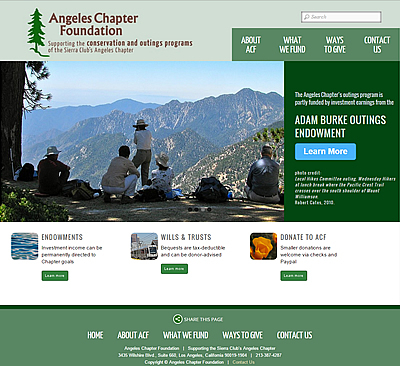 The Angeles Chapter Foundation of the Sierra Club chose WordPress for their content management system. 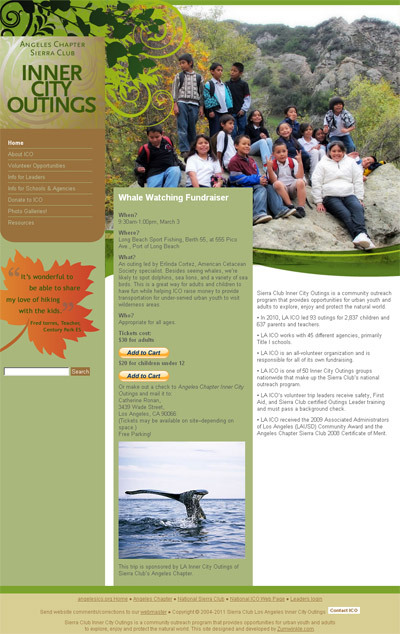 We incorporated features for donations and a private Board of Directors section. 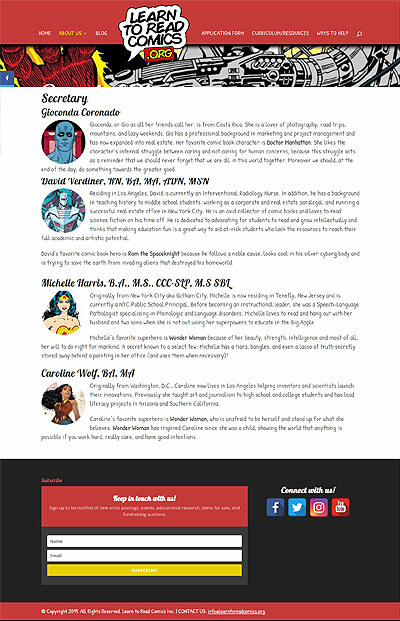 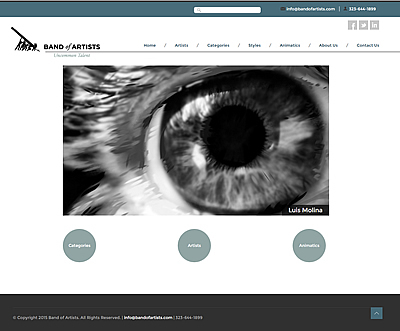 Band of Artists illustration group needed a robust portfolio site specifically designed to be easily updatable by multiple users. 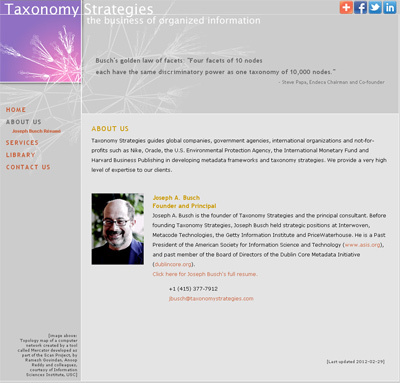 We ensured that visitors can easily find what they are looking for by building, in Drupal, taxonomy-based searches and sortable views. 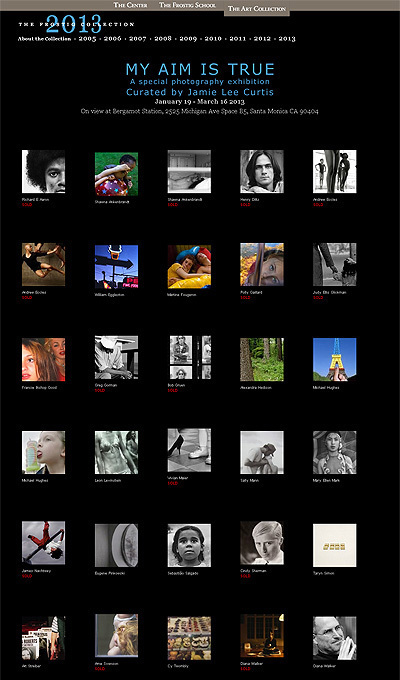 Special masonry-based portfolio pages were created for each artist. 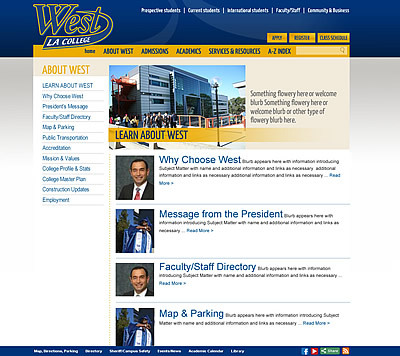 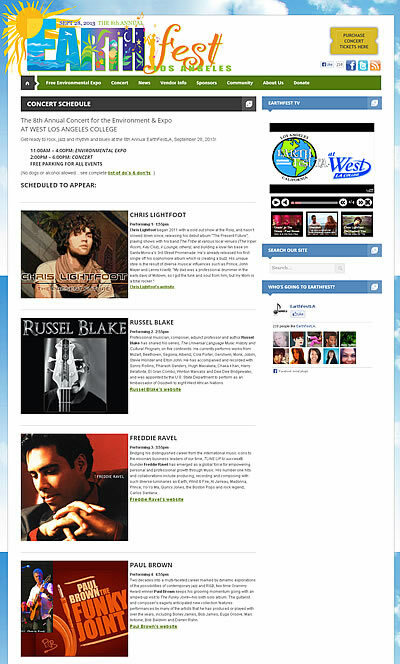 International Studies at West LA College, built with the Kentico CMS framework, is an adjunct site to wlac.edu, tailored specifically for international students and their needs. 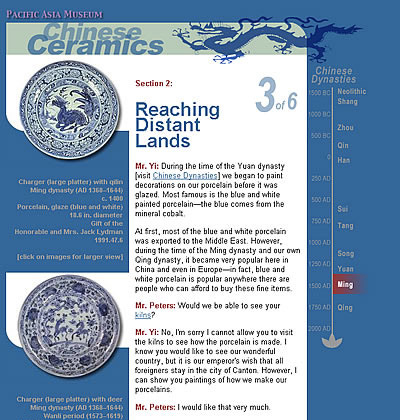 The site includes a dynamic course list and class selection tool, is fully responsive and includes Google Translate integration. 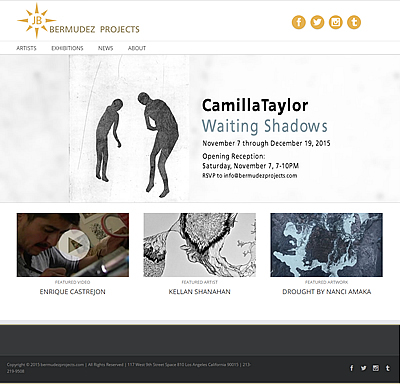 Bermudez Projects WordPress site supports an art gallery and special events and art programming. 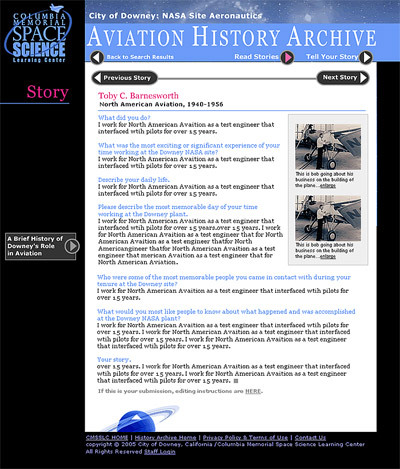 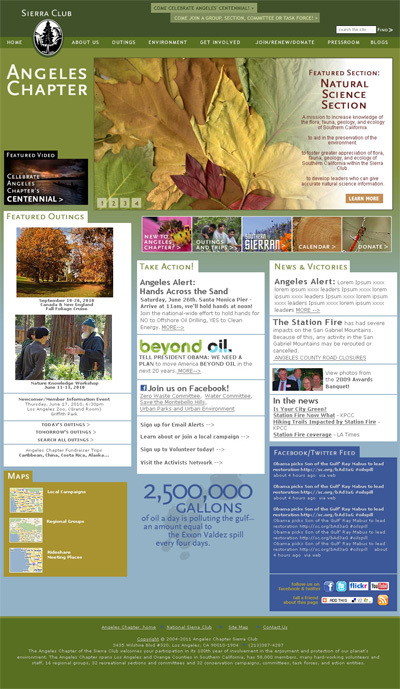 A custom blog delivers the organization’s newsletter journal, The Review. 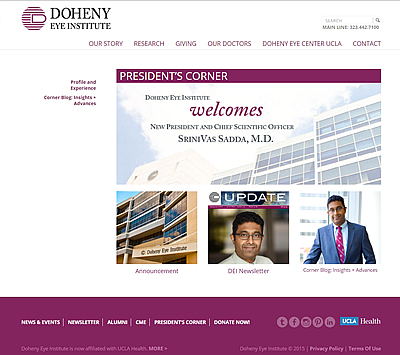 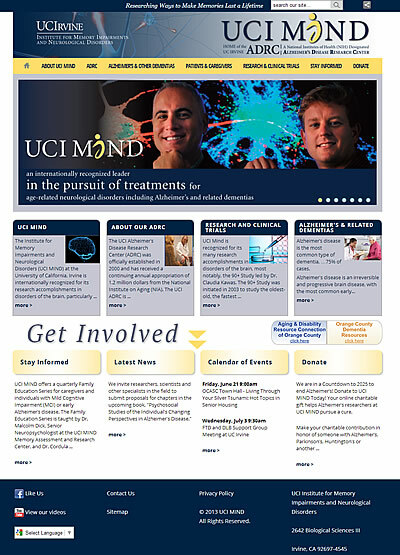 UCLA Doheny Eye Institute is a responsive WordPress site, with customized accordion menus and rollovers. 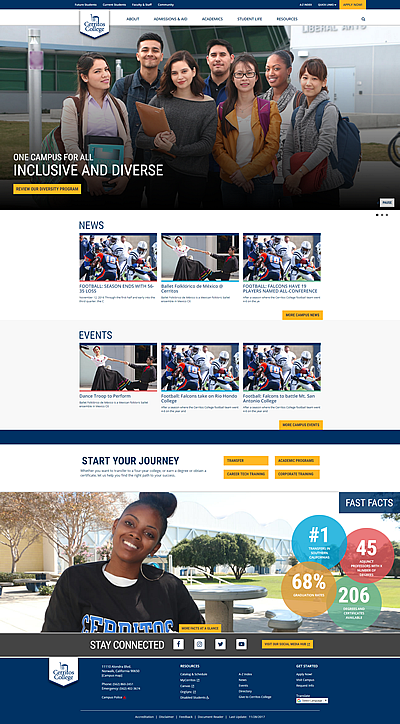 The Safbaby project had a strong pre-existing audience and needed to retain that value, and requested an updated, responsive site with more complex editorial control. 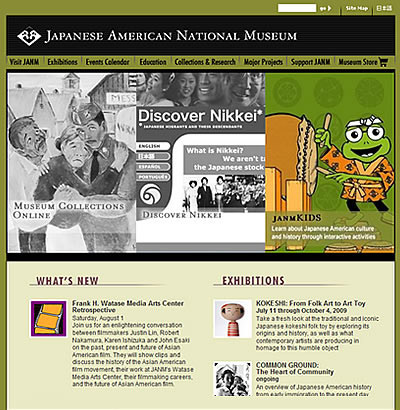 Zumwinkle.com built a the new site in WordPress, and helped coordinate Japanese and Chinese language versions. 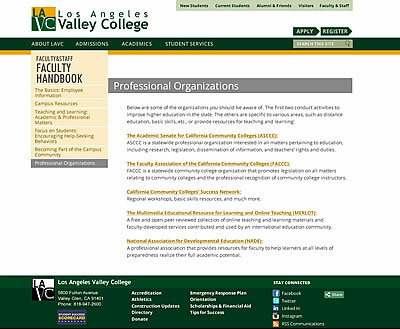 Los Angeles Valley Community College redesigned and developed their primary site on the Kentico CMS. 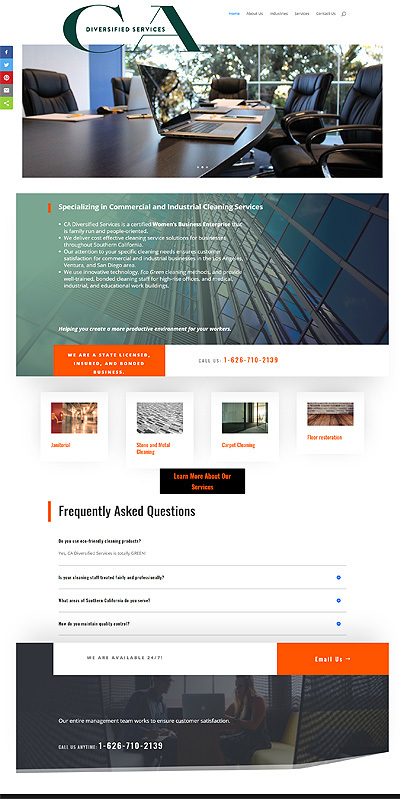 We designed their new web presence, developed new responsive templates, implemented new calendaring and blogging features, and assisted with content production and migration. 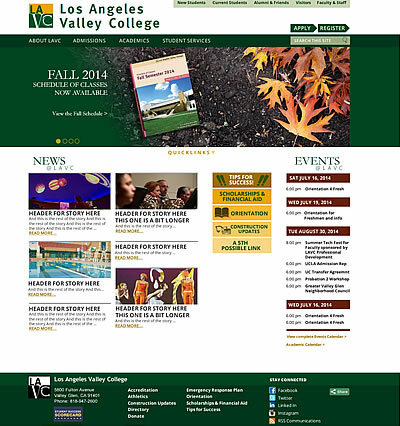 Sign up for classes at LA Valley College. 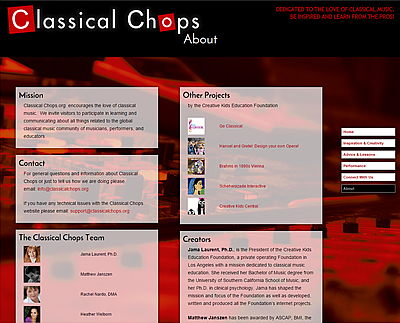 An extensible XML site designed to encourage young people to participate in the world of classical music. 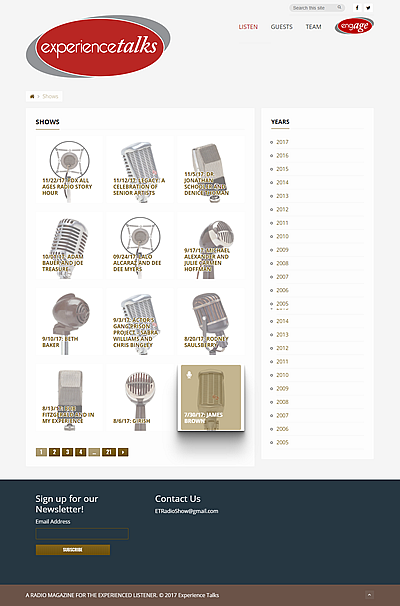 Features include the ability for users to upload videos of their own performances as well as interviews and features geared toward getting young musicians started in the business. 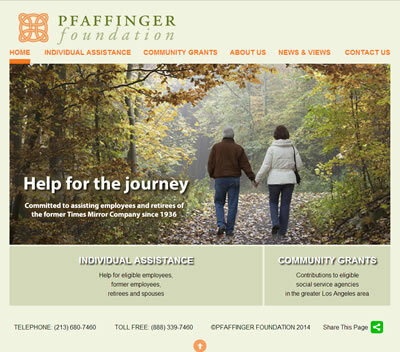 The Pfaffinger Foundation’s new WordPress site is designed with clarity and legibility in mind, easily accessible by potential non-internet-savvy and older visitors, as well as visitors with mobile and other devices. 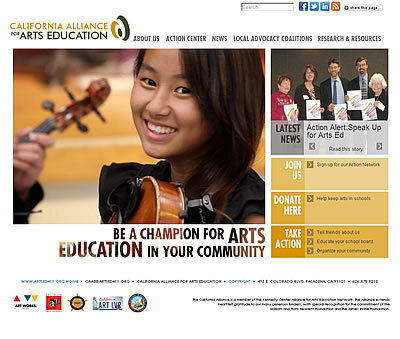 The redesign for Ryman Arts web site reflects the educational mandate of this wonderful visual arts school that supports Southern California high school students. 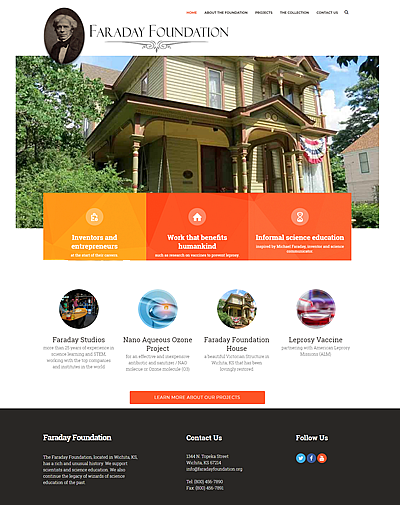 This new fully responsive Drupal 7 site includes a filterable events calendar, tiered members pages, artwork gallery slideshows, and customized admissions form. 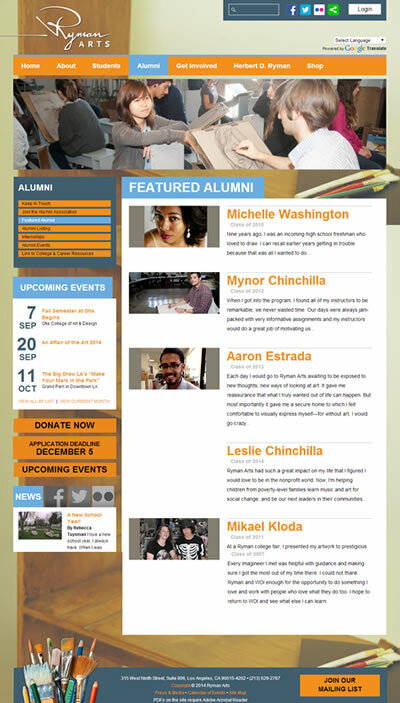 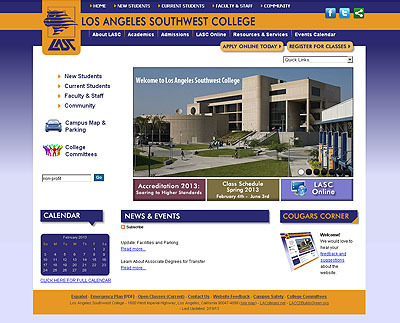 West Los Angeles Community College is redeveloped their site within the Kentico Content Management System. 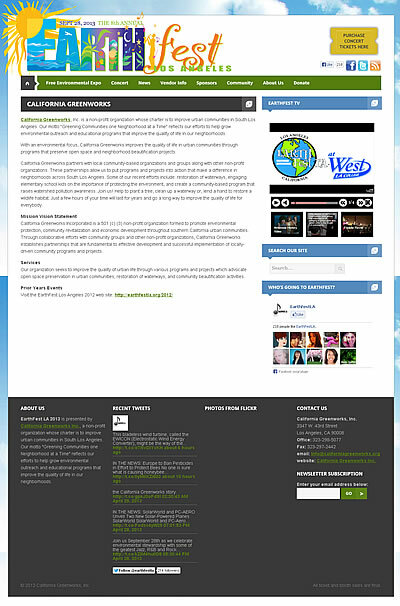 Zumwinkle.com assisted with visual and site architecture redesign, and developed responsive ASP.NET Kentico templates with full functionality. 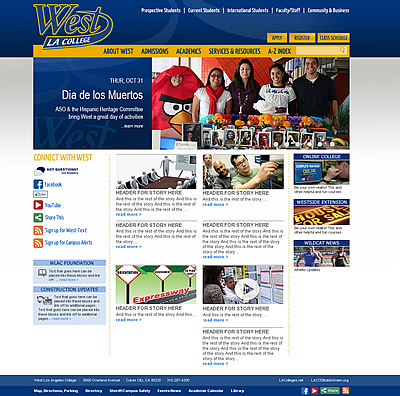 Sign up for classes at West Los Angeles College. 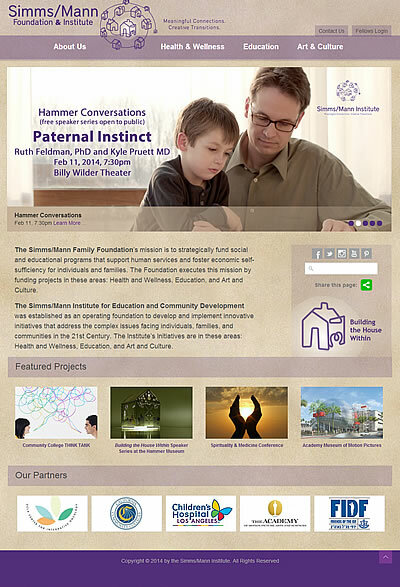 The Simms/Mann Institute for Education and Community Development is a non-profit organization whose initiatives span Health and Wellness, Education, and Art and Culture projects. 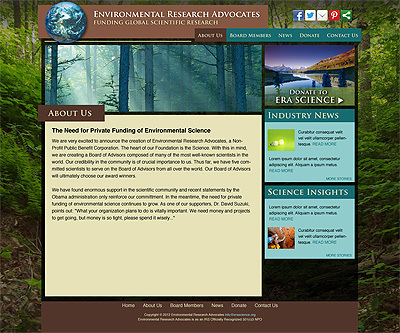 We designed and developed a responsive Drupal 7 site that includes multiple slideshows and a robust members section. 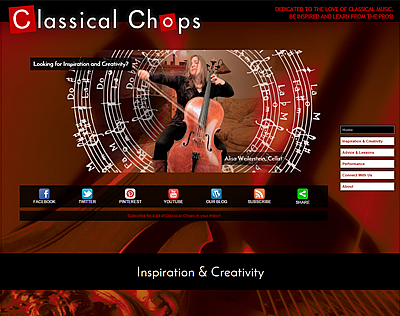 We created a variety of educational Flash games and apps revolving around Classical music for KUSC Classical Radio and the Creative Kids Education Foundation. 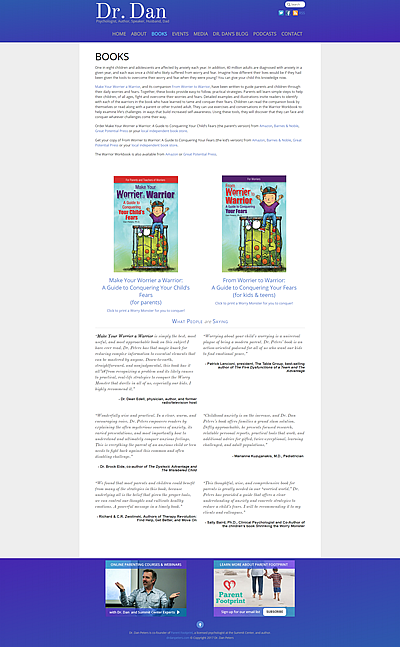 Author Dr. Dan Peters needed an imaginative site for his self-help book for children and parents, “Make Your Worrier a Warrior.” The WordPress site we designed uses the book’s delightful illustrations to create a layered, playful experience. 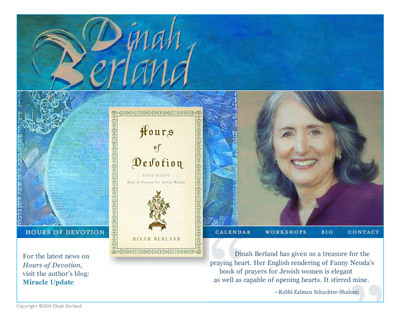 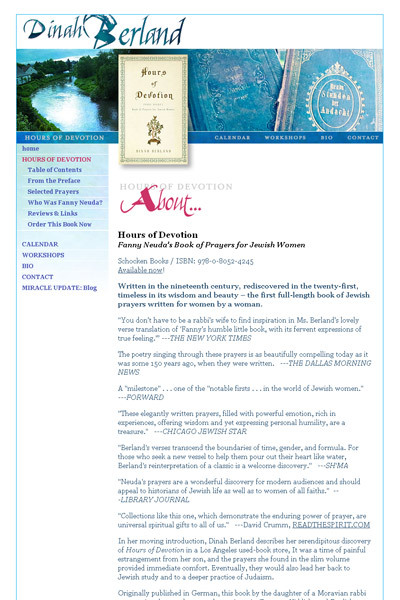 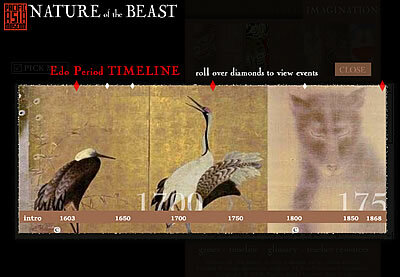 The site features calendars and the ability for readers to submit their own Warrior Stories. 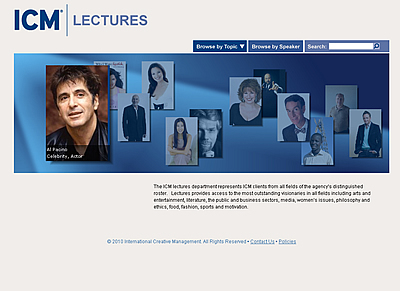 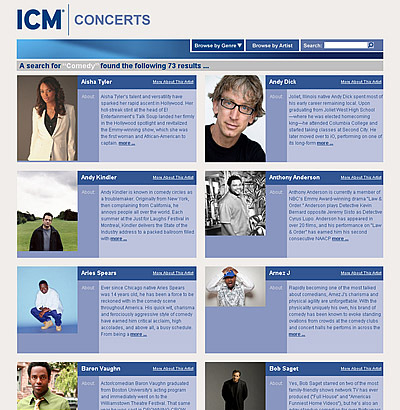 One of the entertainment industry’s top three talent agencies, International Creative Management (ICM) requested three integrated sites: a main site (developed primarily in Flash), and two dynamic sites devoted to Concert artists and Lecture speakers. 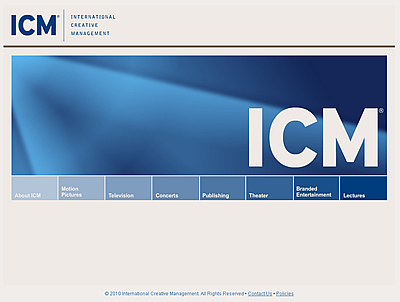 We created a .NET solution utilizing a web service to populate the dynamic site with ICM’s internal data. 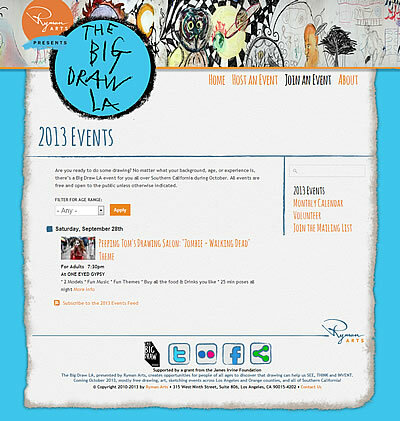 The Big Draw LA is a month-long series of events throughout Los Angeles related to all things Drawing! 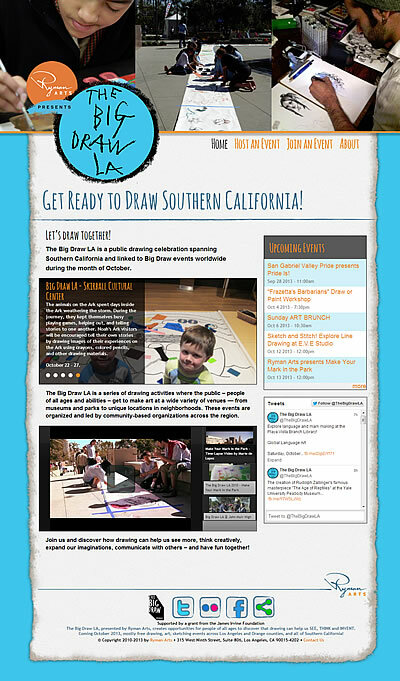 This new Drupal 7 site includes a filterable events calendar and public submission form, scrolling panoramas of completed artwork, and annual updates. 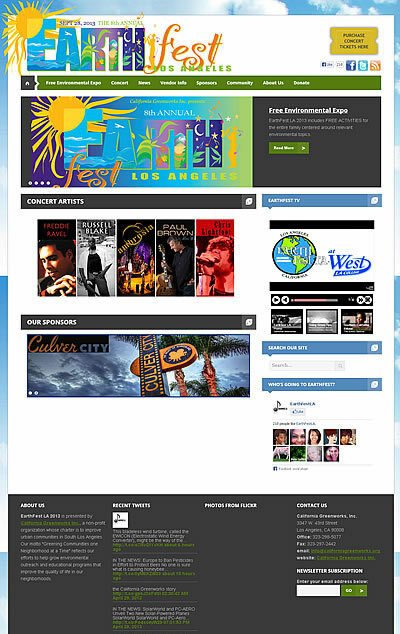 For the annual environmental festival and concert EarthFest LA, we created a WordPress site with customized slideshows, feedback forms, video, audio, and contests! 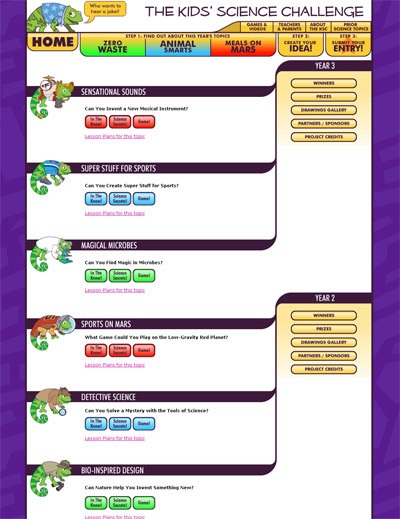 The server file pathing is structured to easily allow for archiving each successive year. 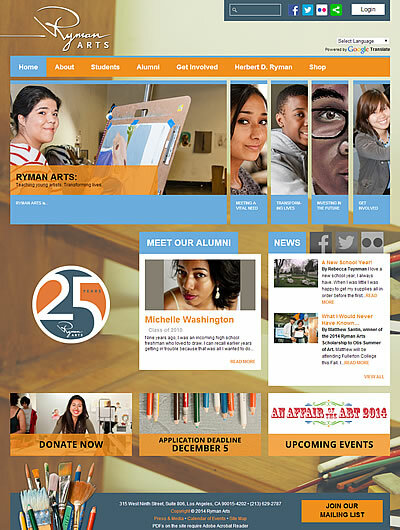 This local community college requested architectural re-organization and a quick visual redesign. 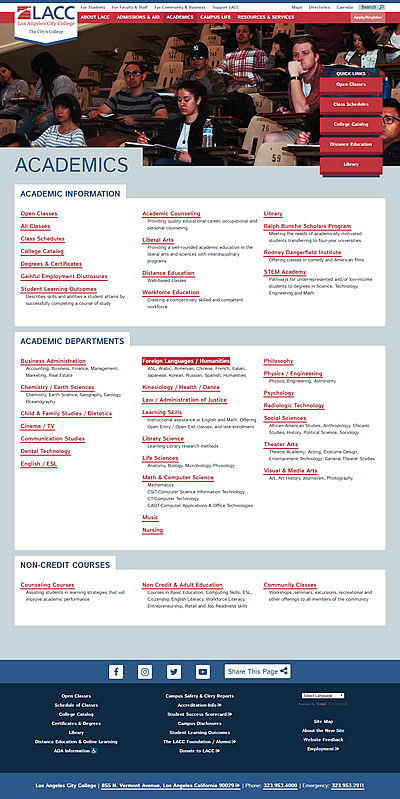 Working within the OmniUpdate Campus 7 CMS, we created a web-accessible dropdown, produced several new departmental sections, updated section sub-navigations, and delivered a new graphical look, all delivered in time for an impending accreditation review. 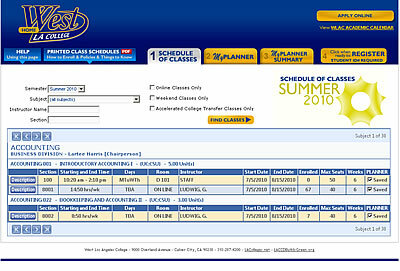 Sign up for classes at LA Southwest College. 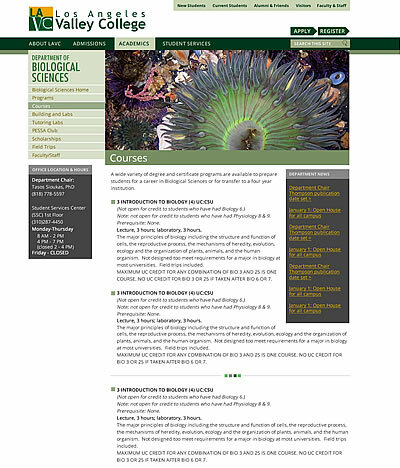 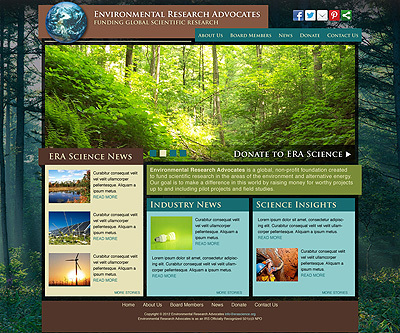 For the ERA organization, Zumwinkle.com developed a Drupal 7 site with capacity for expansion into a community platform and science research “clearinghouse.” The site includes blogs, multiple aggregated feeds, and a back end for scientists and Science Advisory Board members with uploading, publishing, rating, and filtering tools related to an international science challenge award. 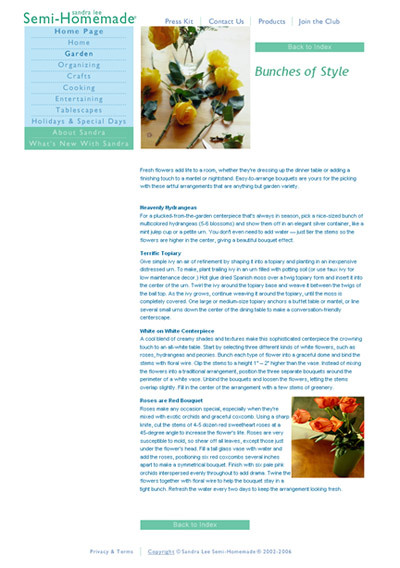 This WordPress site is designed for ease of update. 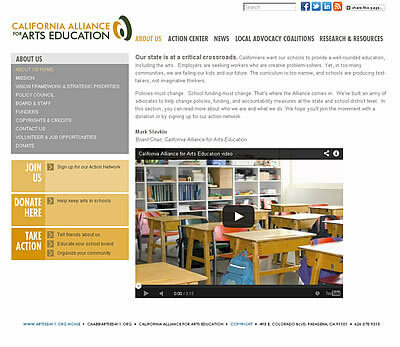 For our longtime clients the California Alliance for Arts Education and in conjunction with designer Ronni Kass, we redeveloped their artsed411.org site within Drupal 7. 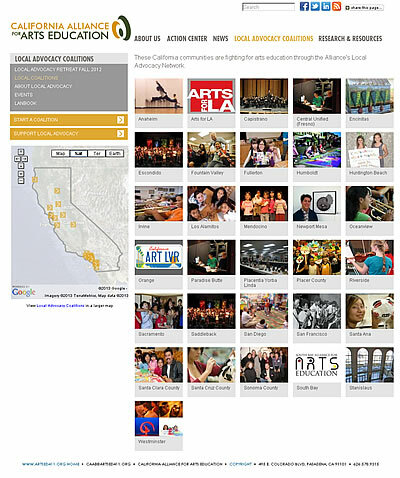 The site utilizes the Drupal Organic Groups module to deliver localized education blog-posts, event calendars, and resource materials to Advocacy Coalition member groups throughout California. 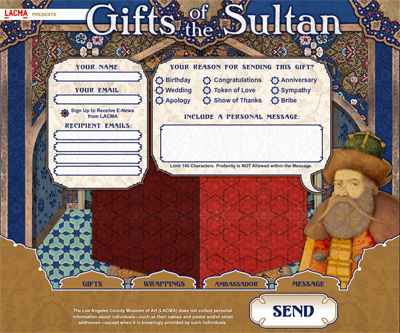 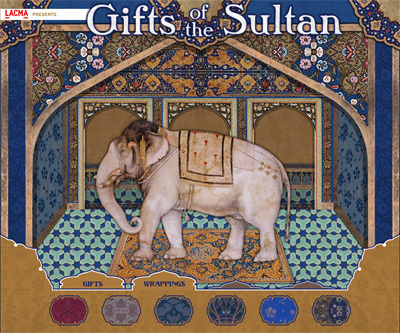 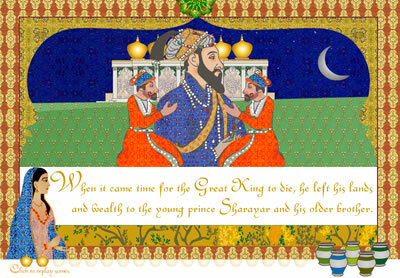 Los Angeles County Museum of Art’s Gifts of the Sultan e-card was created for online use and in-gallery use (laptops as kiosks). 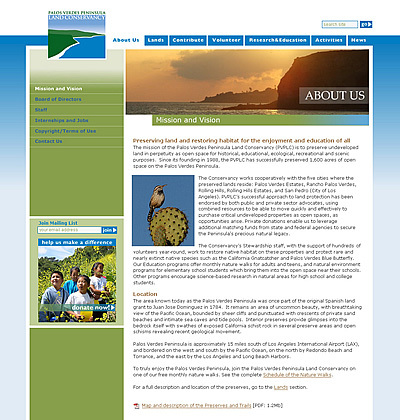 Visitors’ data is retained and reported on via PHP scripting. 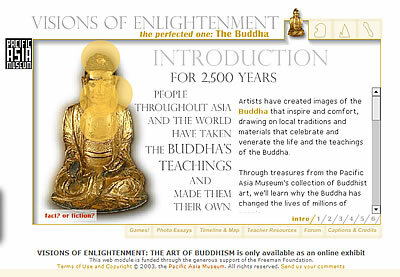 Zumwinkle.com repurposed this e-card application for use by organizations who are hosting the travelling exhibition such as the Museum of Fine Art in Houston and Qatar Art Museum Association, and completed an Arabic version that delivers Arabic left-to-right content. 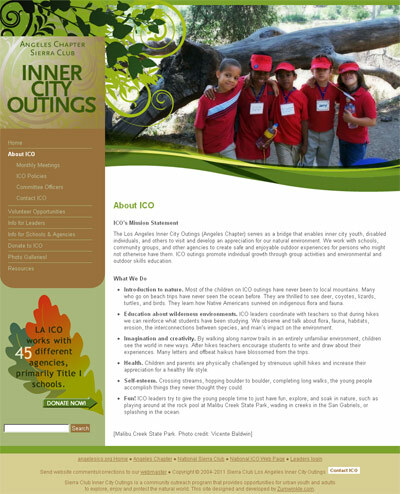 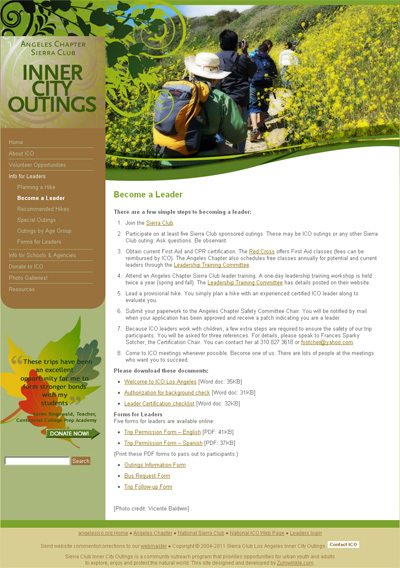 The Sierra Club requested brochures and web site for their Inner City Outings committee. 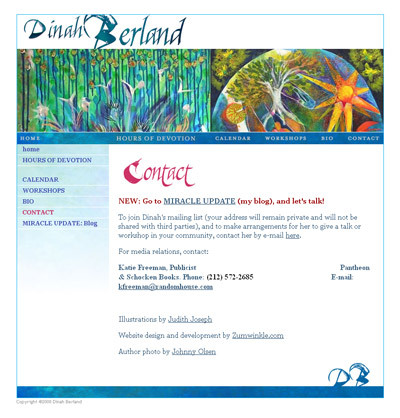 Redesigned monthly newsletters, informational brochures, bulletins, and web site needed new branding via new logo and type specs. 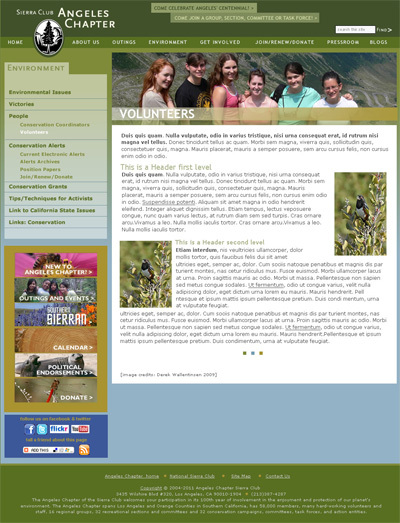 Created display advertising to recruit volunteers. 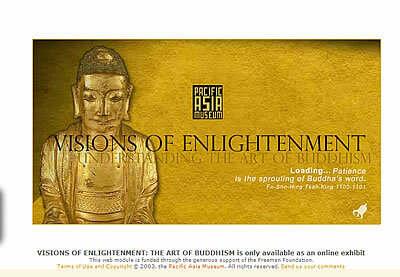 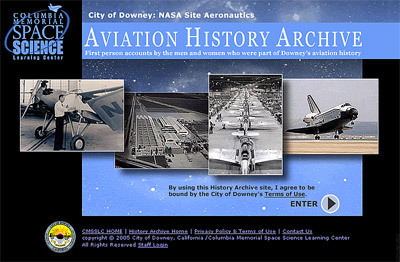 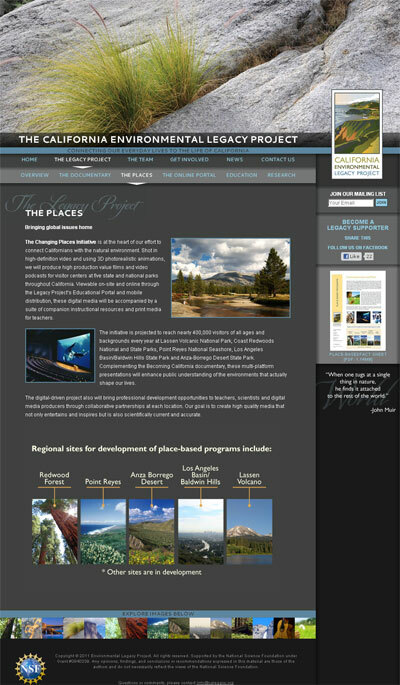 The new informational, educational, interactive web site is WordPress, and includes online forms and photo slideshows. 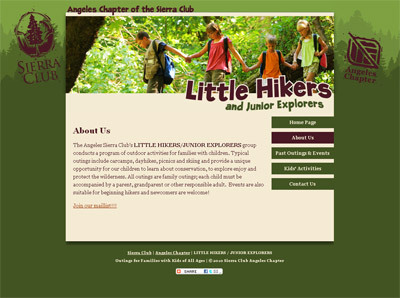 Visit angelesico.org and then powerdown your computer and go on a hike. 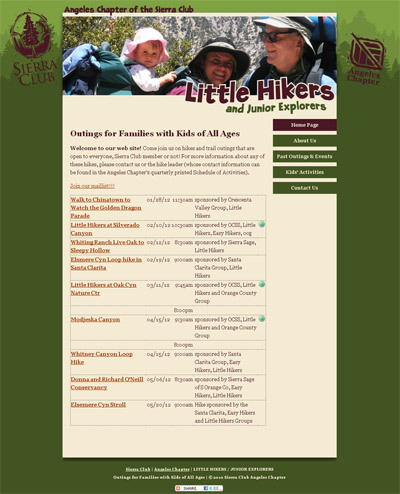 This WordPress site includes a calendar to easily add hikes and trips, and is designed for ease of update. 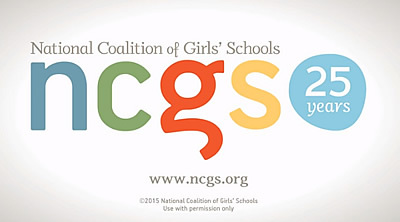 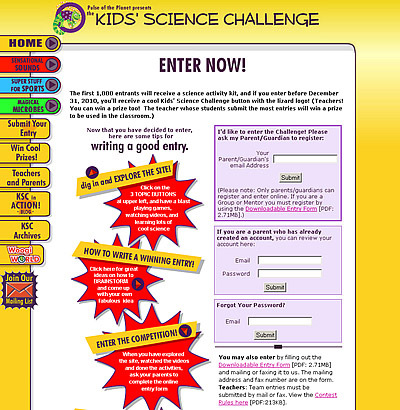 Kids’ Science Challenge is an annual contest for 3rd to 6th graders. 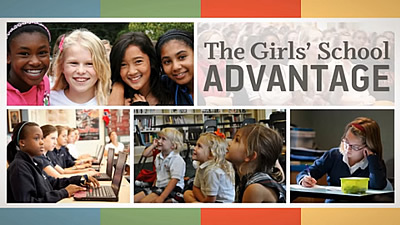 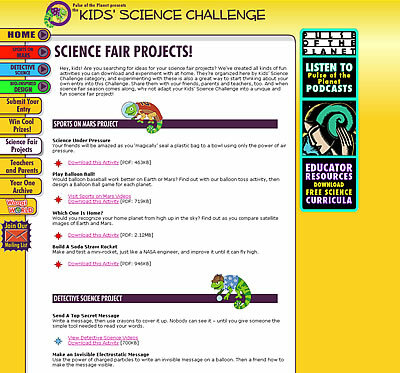 The site features special contests, a blog for kids, downloadable activities, PHP online registration system, customized Flash interactive games that can be emailed to friends, video players and video and audio podcasts, and client-editable Flash text, and are revamped each phase of the project year. 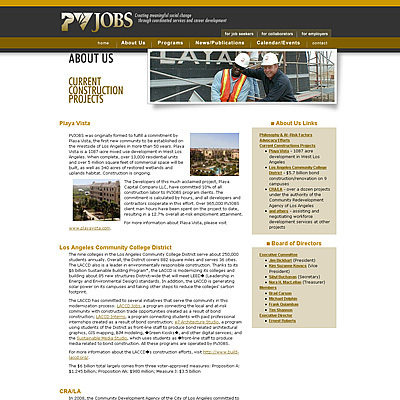 Zumwinkle.com developed the branded identity, and assisted with COPPA compliancy policies as well. 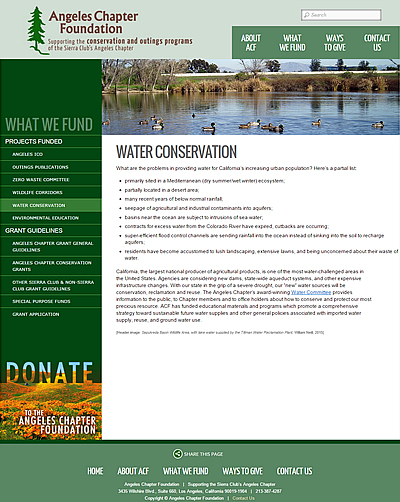 The West Basin Municipal Water District wanted to teach about recommended water conservation measures. 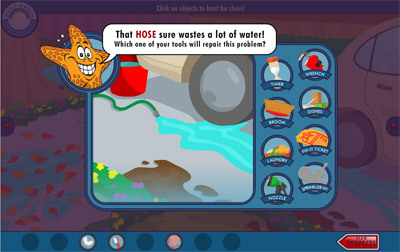 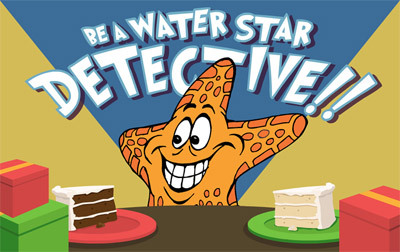 This replayable Flash game determines a culprit character randomly and delivers customied clues with educational content to help identify the monster water waster! 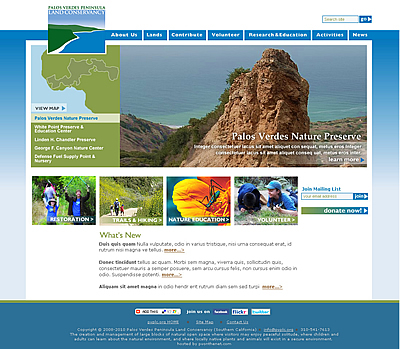 The Palos Verdes Peninsula Land Conservancy’s redesigned site features all new content and images, a password-protected branch, and an interactive homepage map. 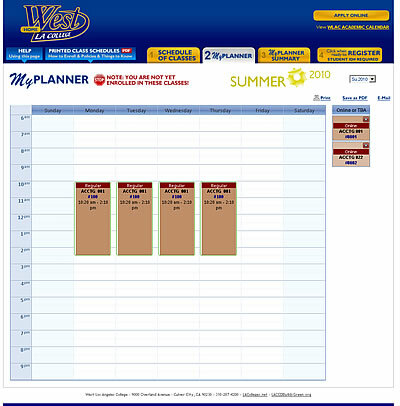 The West Los Angeles College Scheduler/Planner is a proprietary .NET application that allows potential and current students to search and filter class schedules, view the results in weekly calendar format, and save summaries of results for registration. 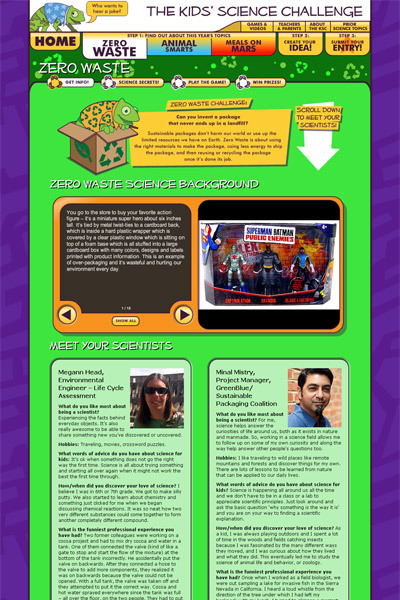 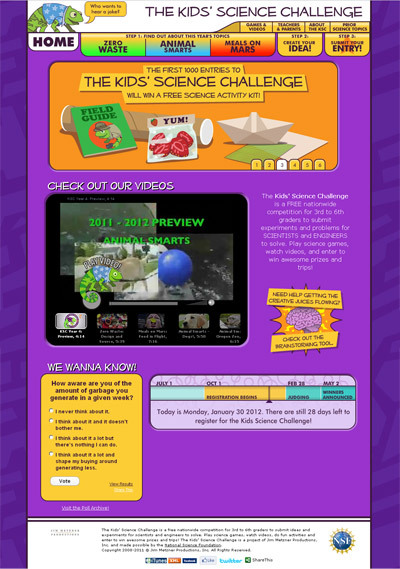 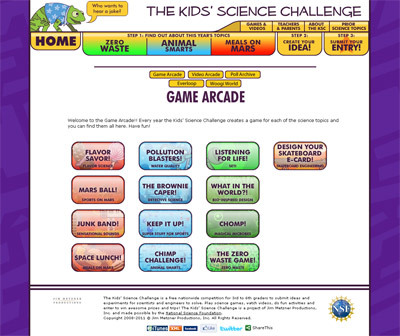 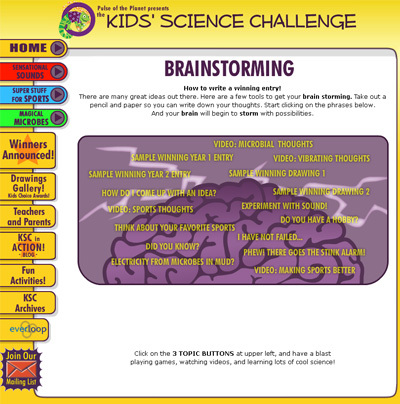 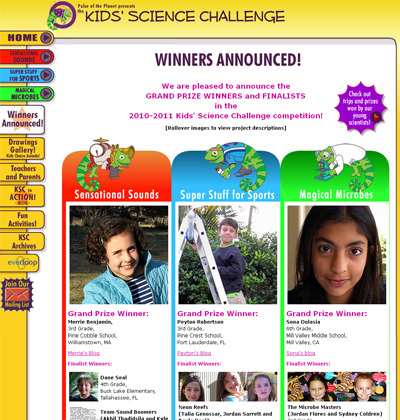 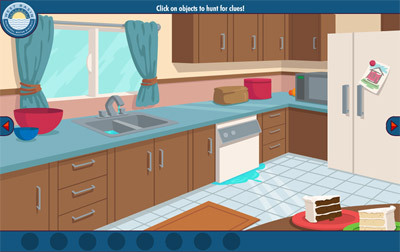 Kids’ Science Challenge is an annual contest for 3rd to 6th graders, and this site consists of a set of Flash pages for kids and HTML pages for adults. 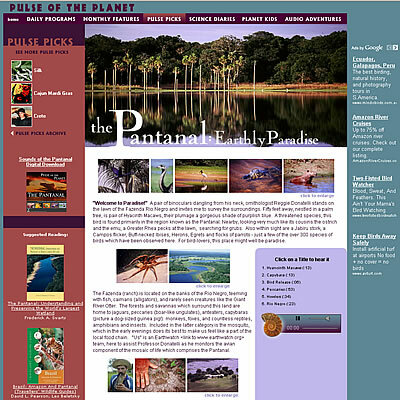 The site features special contests, a blog for kids, downloadable activities, PHP online registration system, customized Flash interactive games that can be emailed to friends, video players and video and audio podcasts, and client-editable Flash text, and are revamped each phase of the project year. 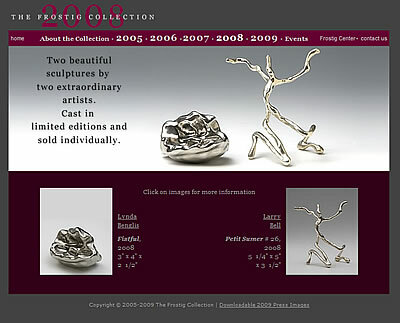 Zumwinkle.com developed the branded identity, and assisted with COPPA compliancy policies as well. 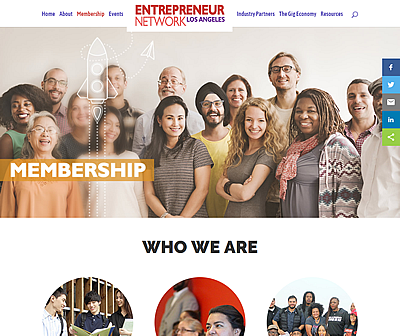 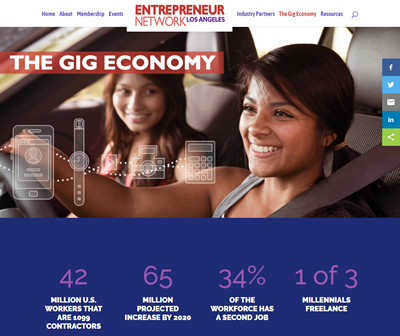 PVJOBS, a job referral, advocacy, and support agency for underserved individuals, wanted a clean, legible site for their clients and collaborators. 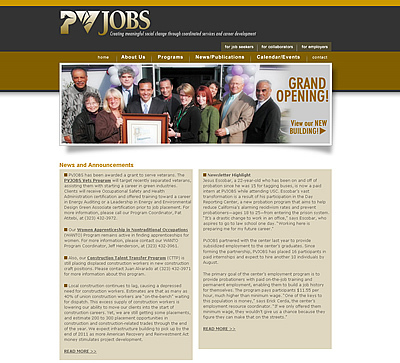 The board of directors can log into their own network pages and slideshows document PVJOBS programs. 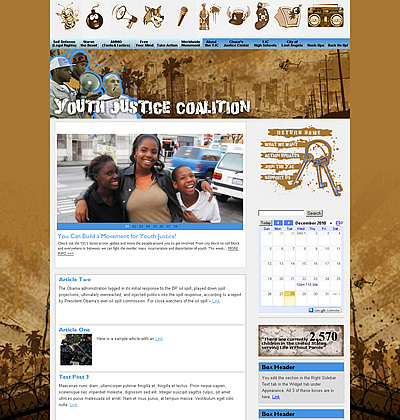 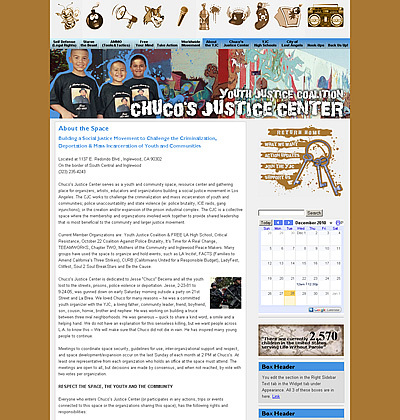 The Youth Justice Coalition requested an easily updateable WordPress site with custom illustrations, feedback forms, navigation, and slideshows. 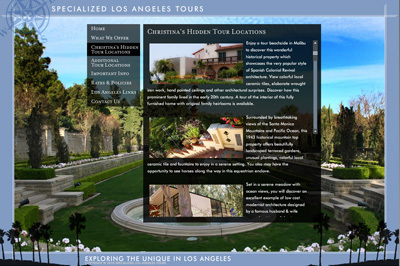 This privately owned tour company’s site is a highly visual Flash solution utilizing dynamic text and images, with a customized HTML page for non-Flash visitors. 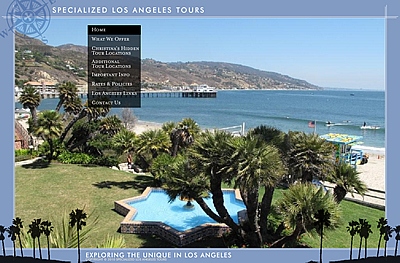 Book your own tour at specializedlatours.com. 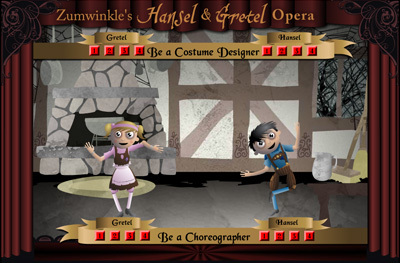 Build Your Own Opera with our online educational module Hansel and Gretel! 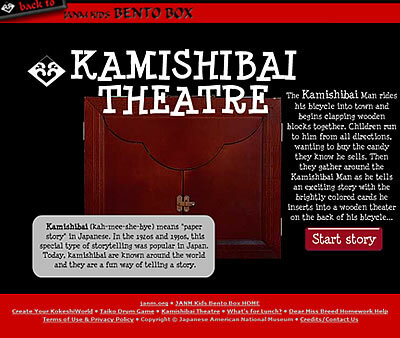 Players can control interactive elements in every scene and watch the play unfold. 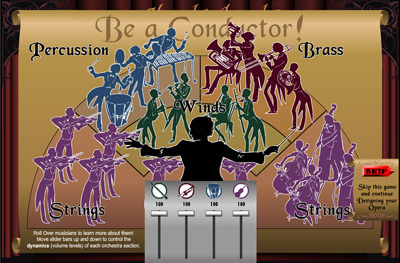 Music listening guides and four embedded music games assist with exploration of the elements of orchestral and opera music and theatre. 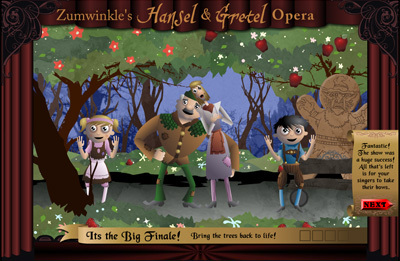 At the end of the story, additional information and resources can be found Backstage at the Opera. 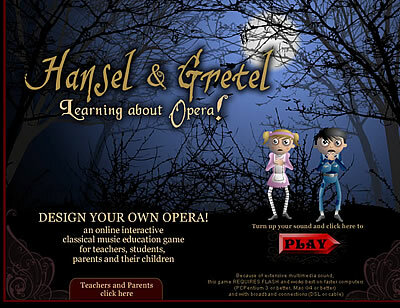 Teachers and educators can download lesson plans featuring music education information and cross-curricular activities on fairy tales. 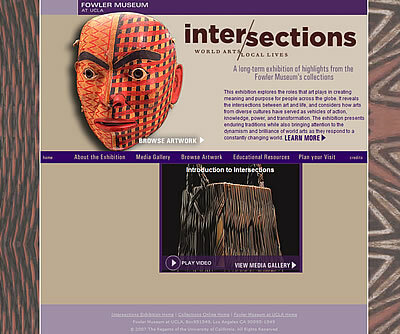 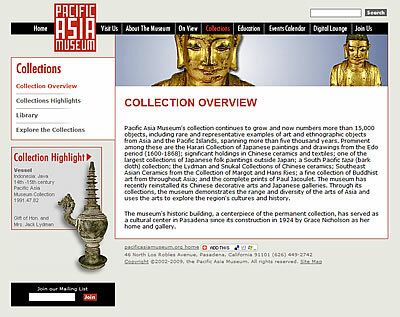 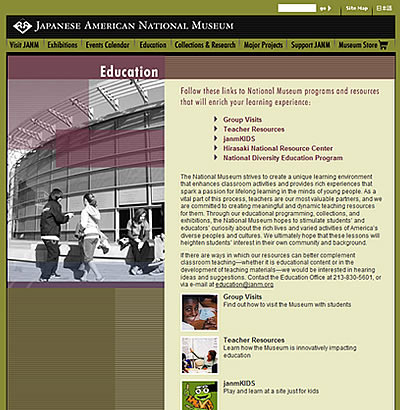 Pacific Asia Museum’s site design includes a filterable events calendar listing, exhibit information, development updates, and site-wide search application. 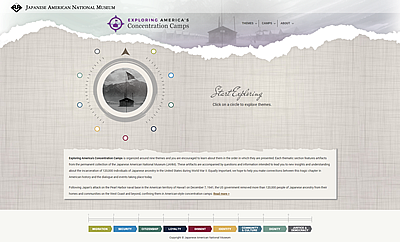 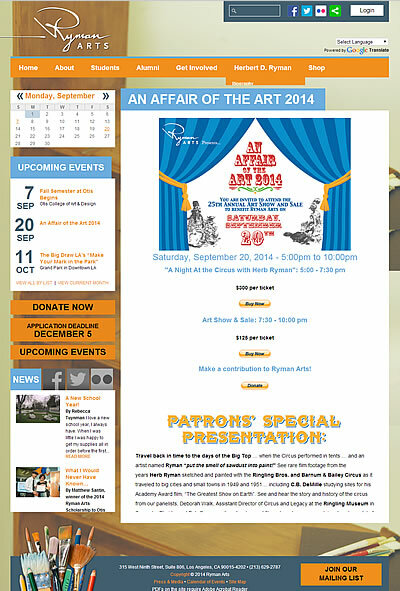 The new dynamic homepage Flash animation promotes upcoming programs and exhibitions. 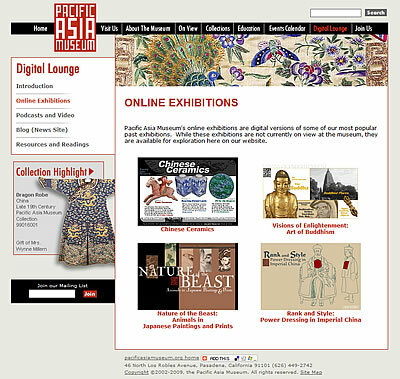 The Digital Lounge incorporates various audio and video podcast multimedia. 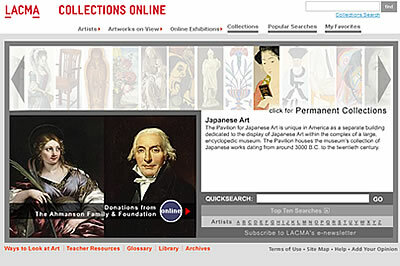 And the searchable online catalogue is “curated” with category groupings of 6,000 artworks by style and locale. 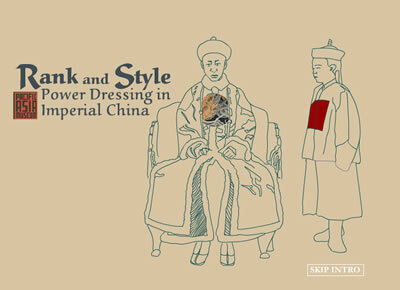 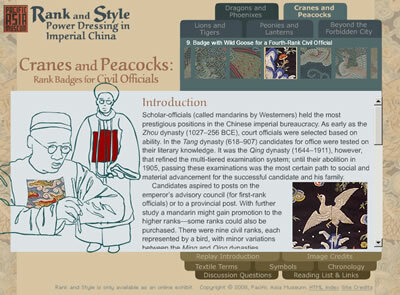 Rank and Style: Power Dressing in Imperial China is an online exhibit exploring the fabric emblems worn by China’s rulers for centuries, and includes in-depth essays, teacher resources, glossary and the ability to zoom into detail views of 97 artworks. 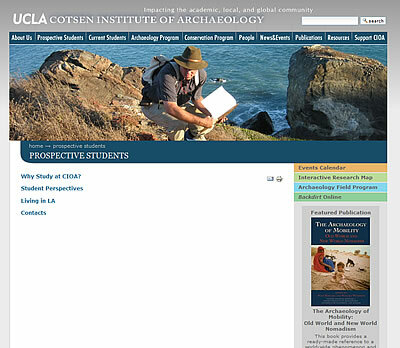 Built in the Plone framework, the UCLA Cotsen Institute of Archaeology’s homepage highlights a specific project, easily customizable by staff. 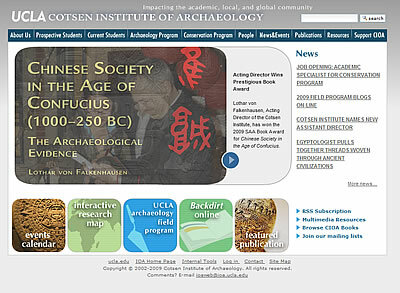 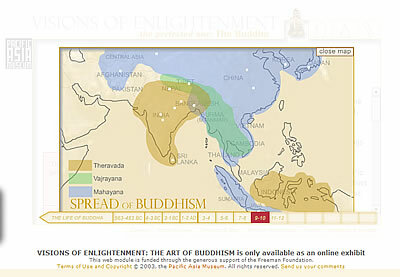 Site also includes an interactive world map that displays images and descriptions of current Cotsen’s international projects geographically. 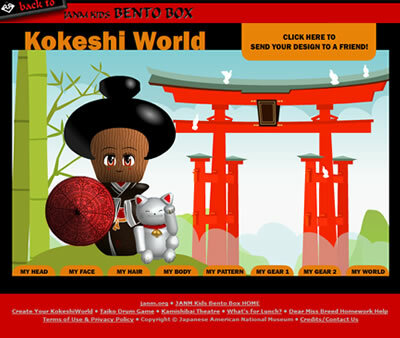 This hilarious Flash game teaches about the unique cultural Japanese doll sculpture called Kokeshi. 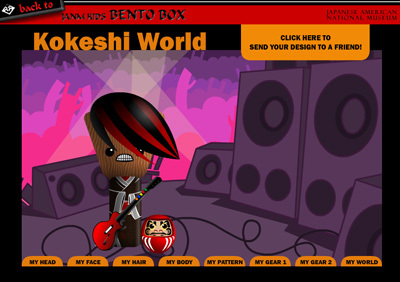 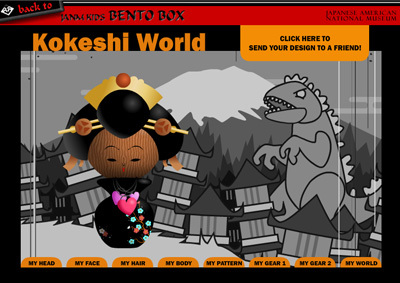 Visitors can create and customize their own doll and background with other cultural elements and unique illustrations, and email the results to friends. 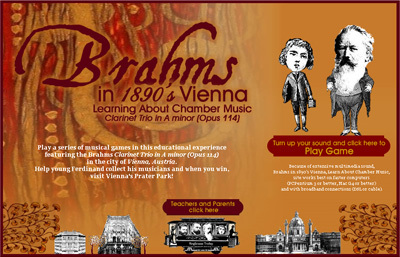 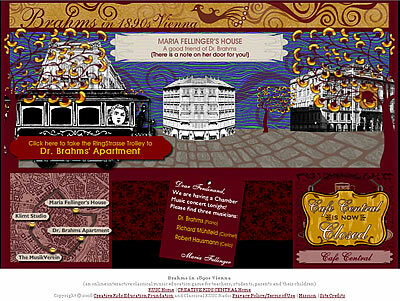 Brahms in 1890’s Vienna is an online educational experience featuring the Brahms Clarinet Trio in A minor Opus 114 and setting the music in a story about him, and his city, Vienna, Austria. 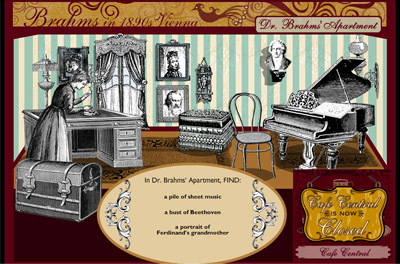 Music listening guides and music games explore the elements of chamber music and the characters move through the historical sites of Vienna and are introduced to the art of the famous Gustav Klimt. 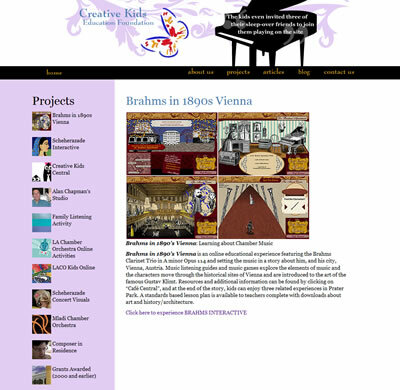 A separate resources teaches more about musicians and architecture, and at the end of the narrative, kids can enjoy three related experiences in Prater Park. 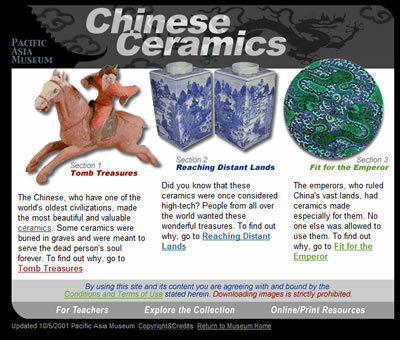 A standards based lesson plan is available to teachers, complete with downloads about art and history/architecture. 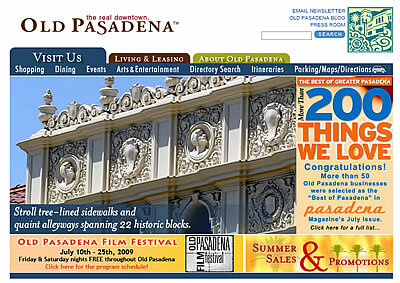 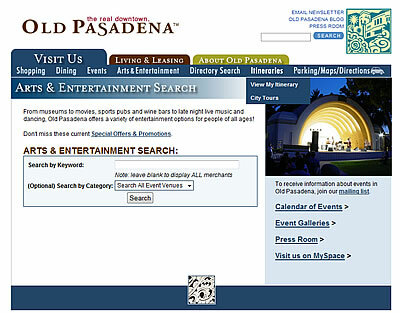 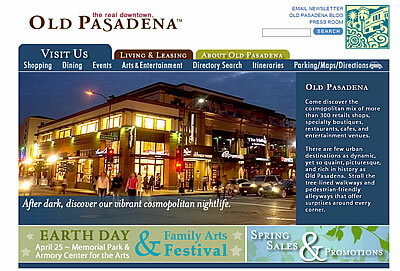 Old Pasadena Management District needed a modern revamp of their site to highlight their many resources. 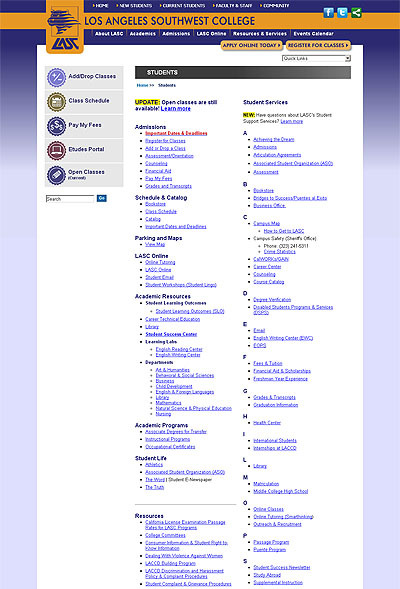 Their earlier database searchable, browseable merchant directory application was redeveloped to more easily display results. 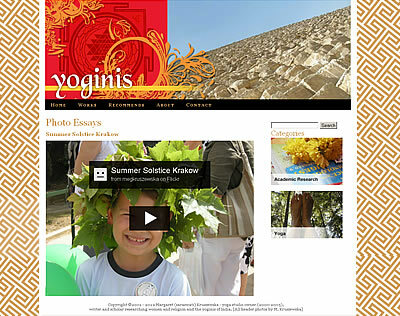 Additional features include events slideshow galleries and a WordPress blog. 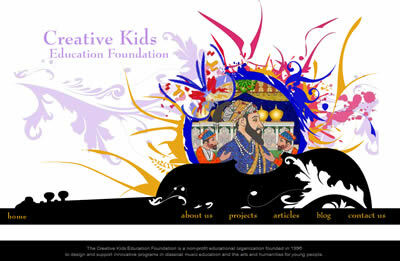 Creative Kids Education Foundation’s web site focuses on the creative wealth of the Foundation’s music-oriented, content-rich commissions. 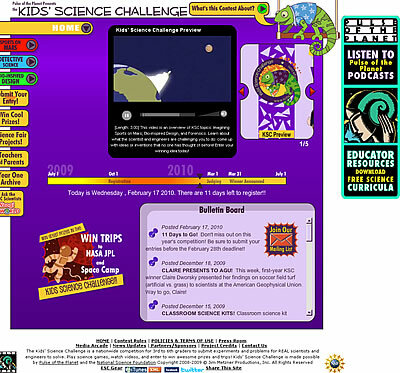 For the popular unconventional NPR radio show with short spotlights on nature and culture, we selected a creative color scheme and strong narrative features. 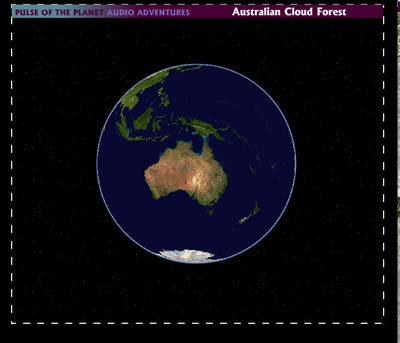 Includes thousands of database-delivered Audio Programs and Feature Stories, 16 scientist blogs, e-commerce features, downloadable programs and curriculum, and a Flash animated “audio adventure” exploring the Australian Cloud Forest. 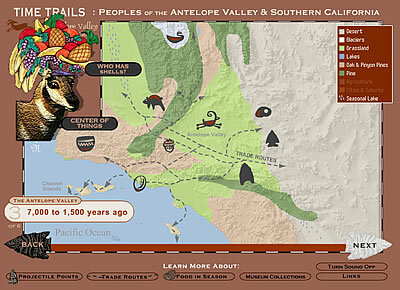 Time Trails: Peoples of the Antelope Valley and Southern California is an interactive Flash timeline of seven maps displaying natural and human migration patterns and commercial growth of the Antelope Valley in California. 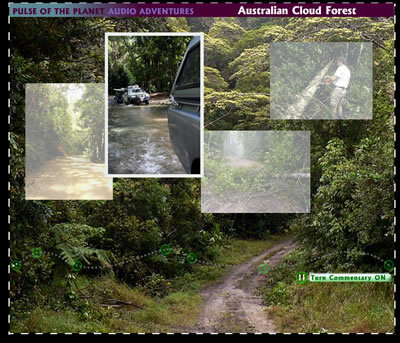 Includes kid-friendly rollovers, audio voiceovers, and morphing topography. 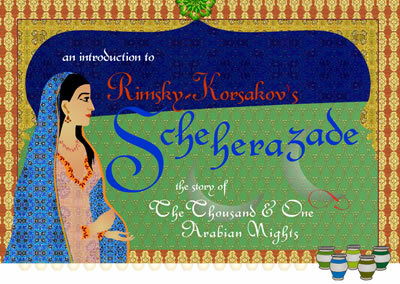 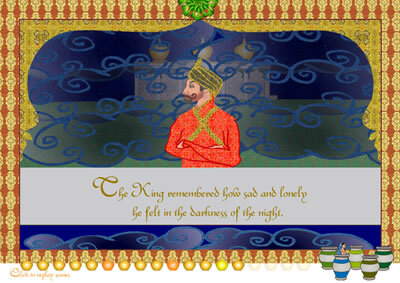 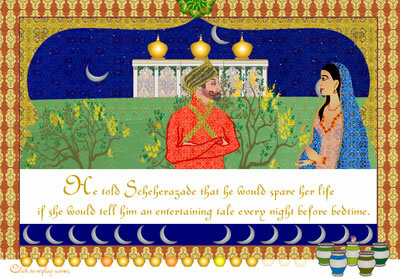 Scheherazade Interactive is a music education experience based on the beautiful music of Rimsky-Korsakov and includes a metaphorical narrative of the 1001 Nights story, a separate resources section with activities related to art and geography, and four embedded games that teach rudiments of music and listening skills based on the National and State standards of music education. 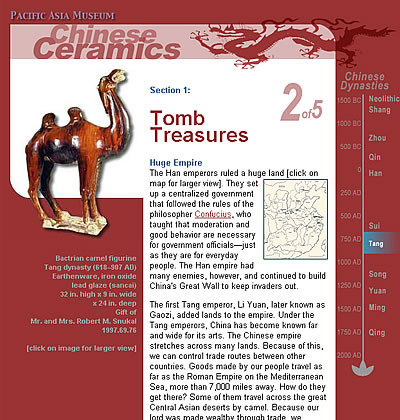 A standards-based lesson plan is download-ready for teachers complete with printouts and quizzes for students. 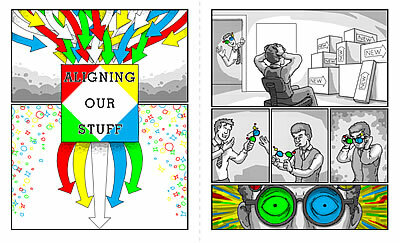 We assisted with extensive user testing, and created a customized module. 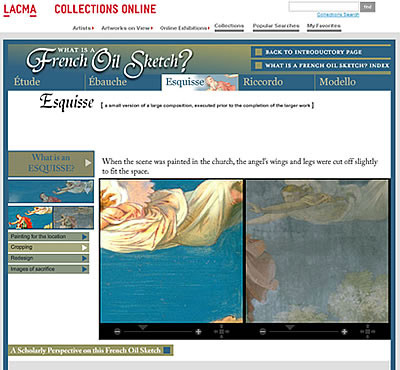 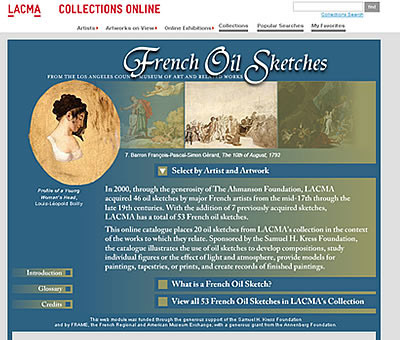 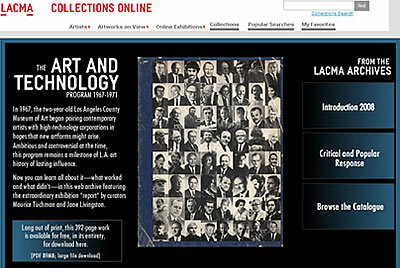 We designed the look-and-feel and information architecture of LACMA’s online image and library database. 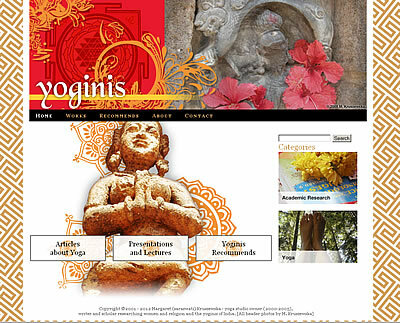 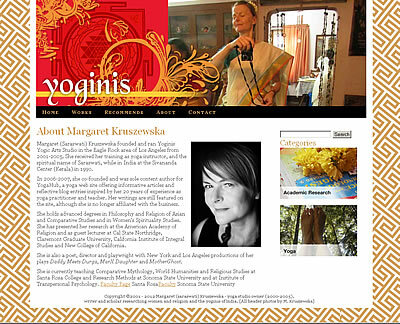 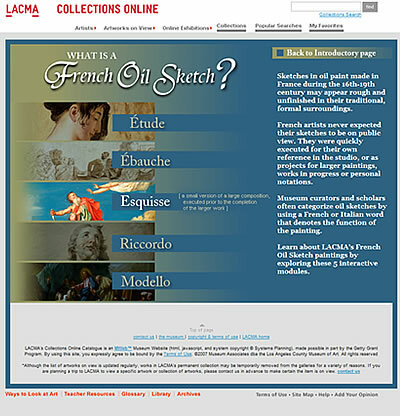 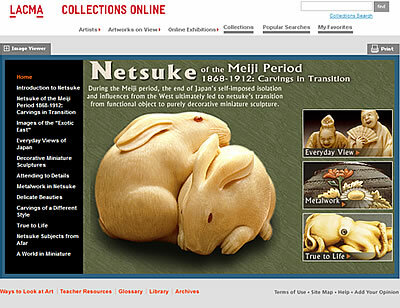 Site includes a customized Flash homepage, departmental “highlights” pages, access to deep data relating to specific artworks, educational components, online exhibition modules. 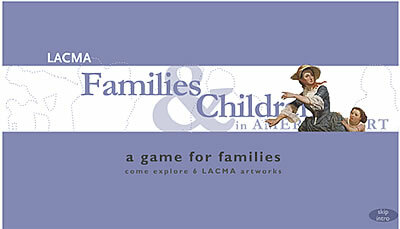 An educational module introducing several of LACMA’s seminal works of art in a kid-friendly manner. 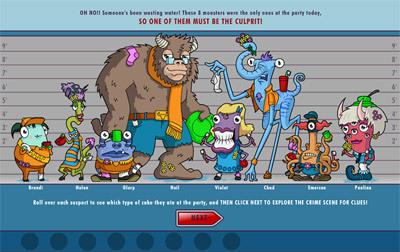 Players search for obects listed in an “I Spy” manner, and then can drag-and-drop dialog boxes onto the artwork’s characters (and write their own dialog as well!) 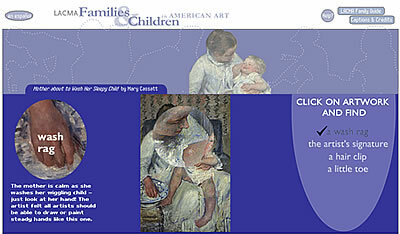 Feedback on all user-driven decisions delivers art historical and critical info to kids. 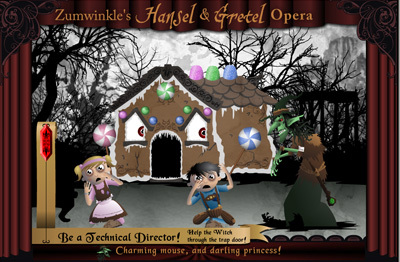 Zumwinkle.com created customized background music for each work as well. 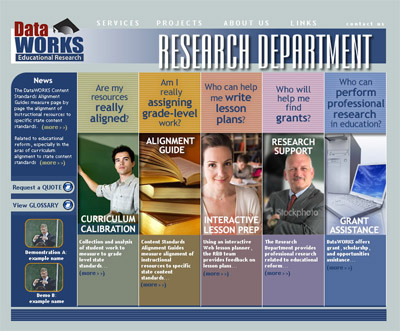 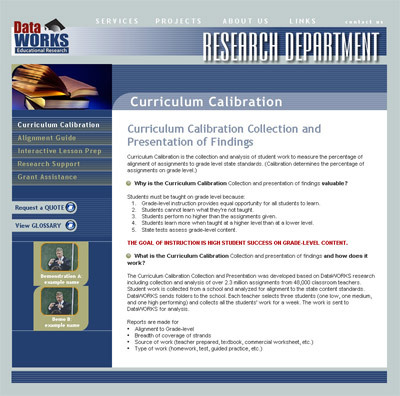 Educational consultants DataWorks needed a robust intranet with some public-facing features. 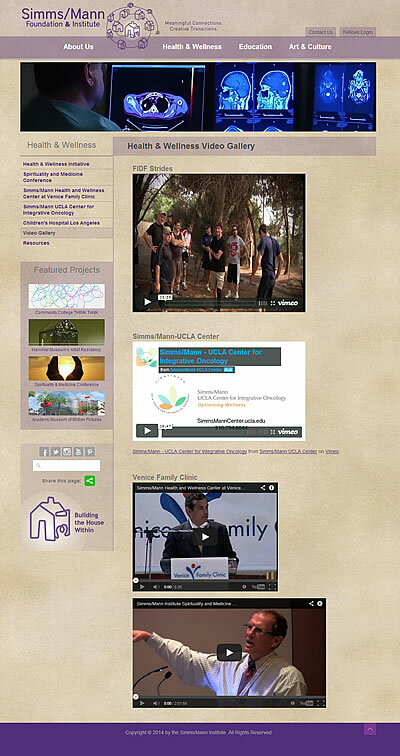 We worked with their in-house IT staff and designed a flexible front-end with video-sharing functionality. 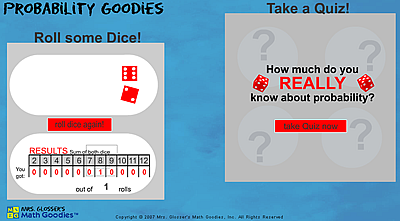 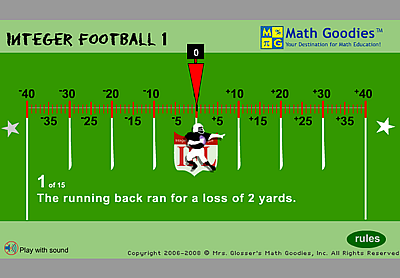 We created several Flash modules that taught basic math skills and concepts in fun ways for Mrs. Glosser’s Math Goodies online tutorials. 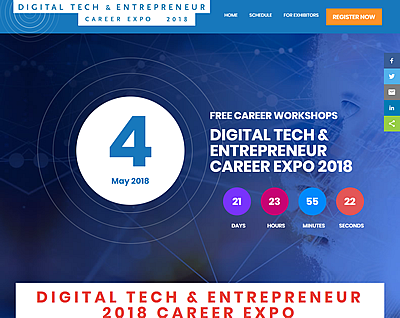 We also designed and generated web banner ads and print materials such as CD labels and inserts, bookmarks, and downloadable PDFs. 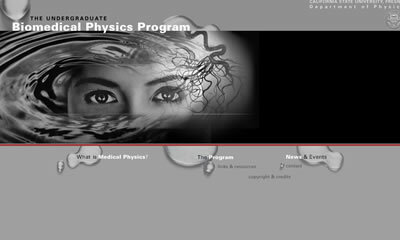 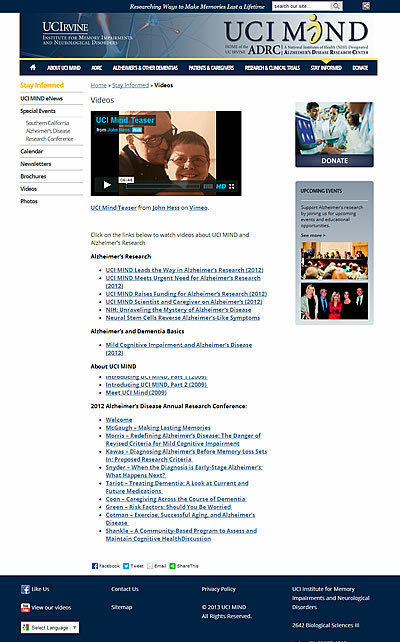 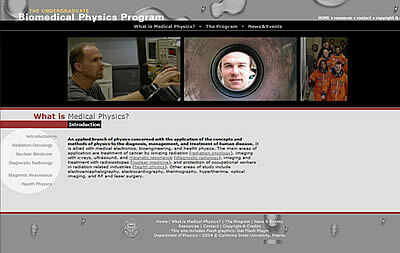 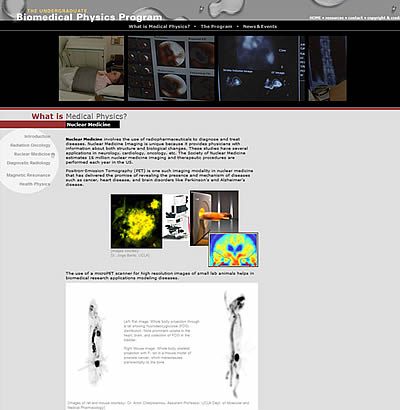 The Biomedical Physics Department at California State University Fresno asked for a departmental site that explored the potential of medical professions impact upon humankind, in an imaginative narrative fashion on the homepage, and in new and fascinating animations, slideshows, and videos throughout the site. 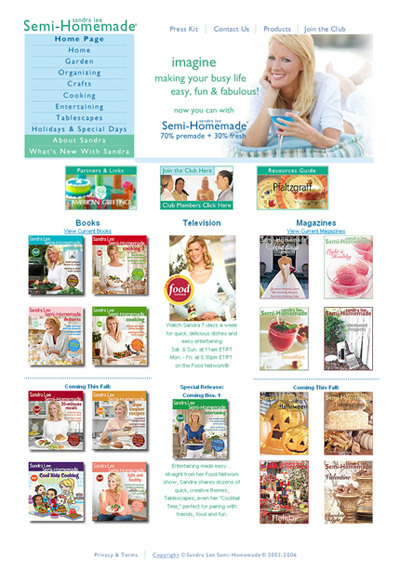 In conjunction with Lentini Design, design and development of cooking/entertaining advice site for Food Network star and Lifestylist Sandra Lee. 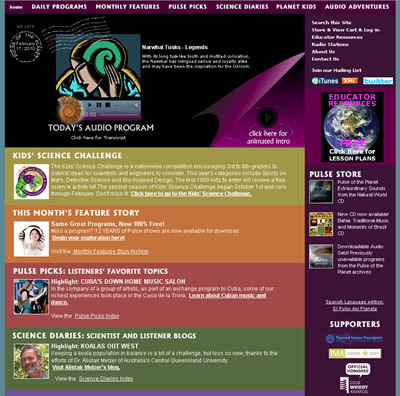 Site includes protected membership area, subscription form, and HTML email announcements. 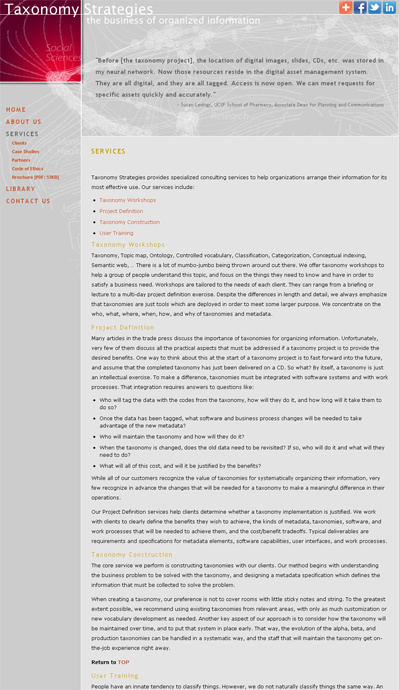 Supervised development group that implemented subscription database. 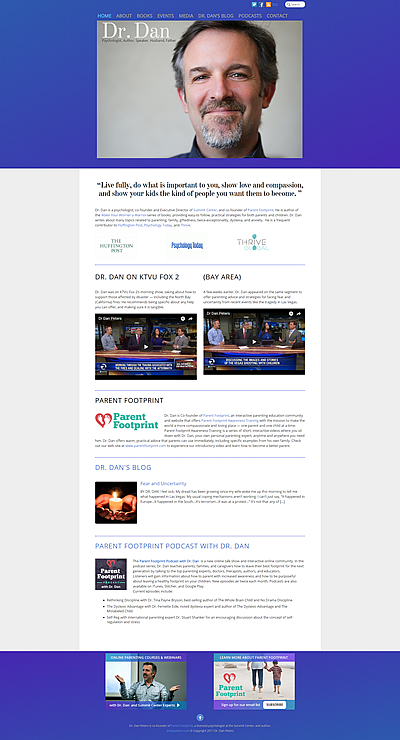 Includes Semi-Homemade web magazine, updated with new issues and articles, built and organized with a consistent infrastructure for easy templatizing; well-documented, easily maintained and archived. 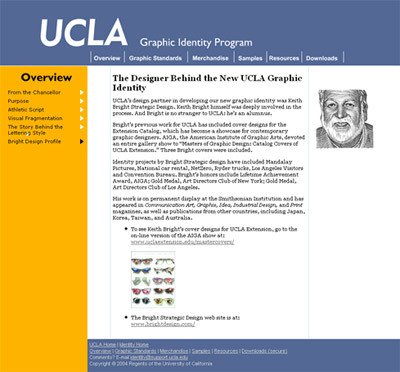 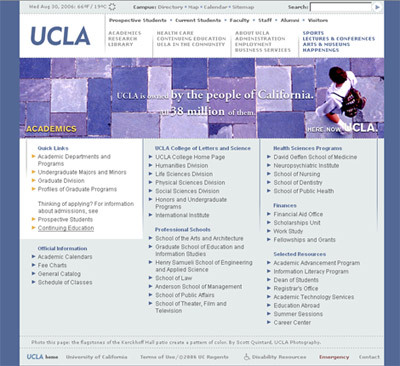 Built templated pages for UCLA’s main entry site and Spotlight Archive, with heavy emphasis on Server Side Includes for ease of maintenance. 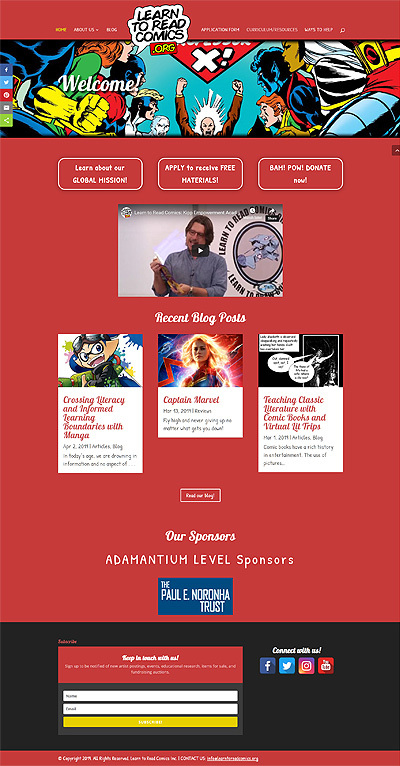 Designed custom header graphics, designed and scripted embedded Flash components such as custom EventsScroller and Flash “Spotlight Teaser” on front page. 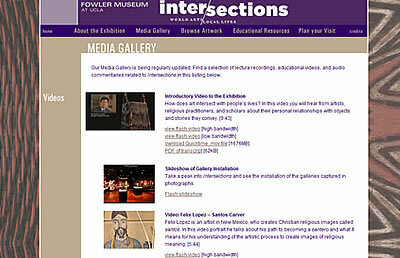 Assisted with integration of RealMedia, Flash, and audio multimedia solutions. 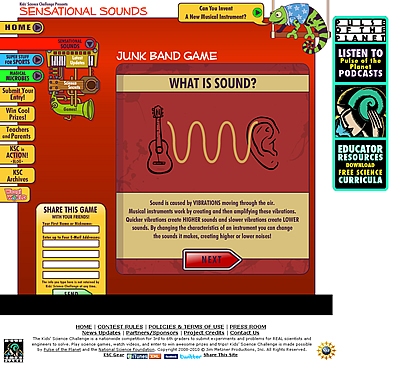 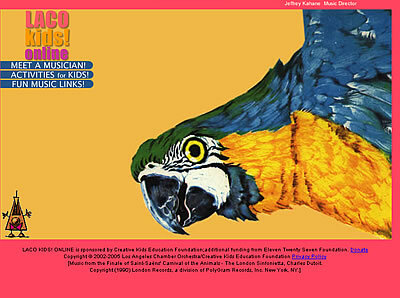 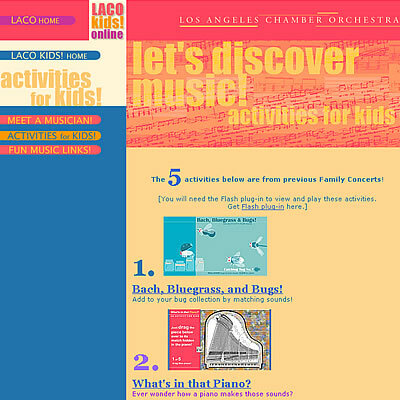 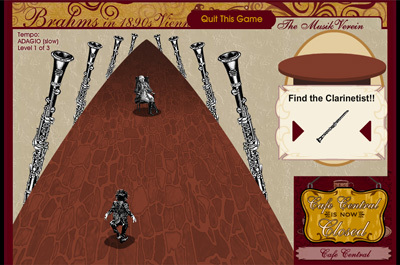 Several Flash interactive games were developed for the Los Angeles Chamber Orchestra’s Family Concerts. 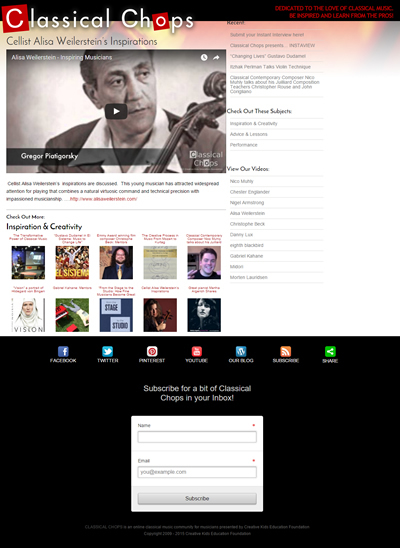 They featured music from upcoming concerts, facts about the compositions and the composers, and fun innovative activities related to classical music. 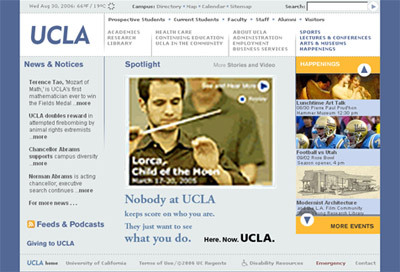 Picked as Yahoo! 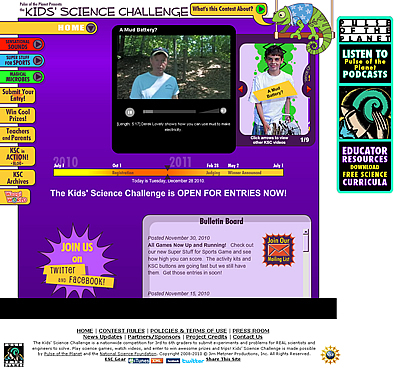 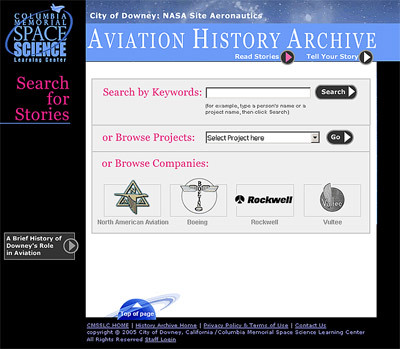 Site of the Day in April 2003! 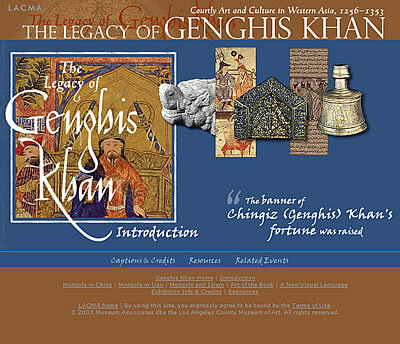 This exhibition module highlighted 28 works of art from The Legacy of Genghis Khan museum exhibition presented by LACMA’s Islamic Art Department. 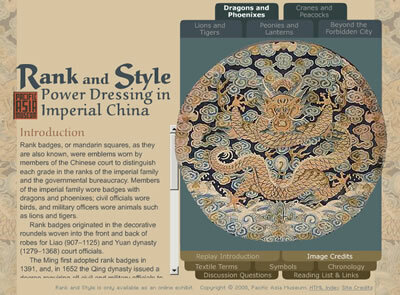 Each object was presented with didactic text and close-ups of object details, illustrating themes, patterns, and workmanship. 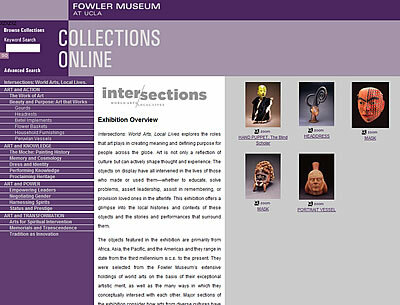 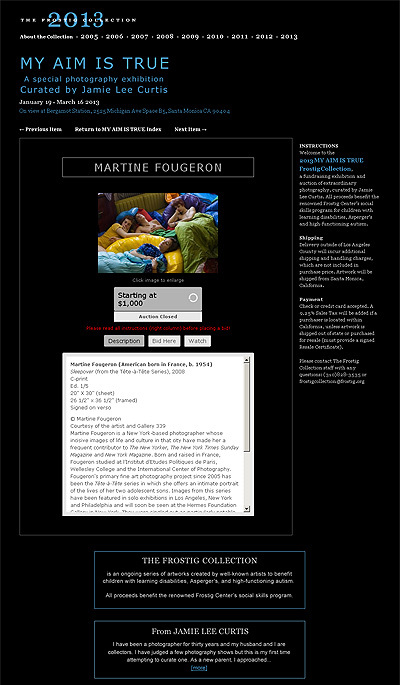 Eight objects were selected for special presentations in FlashMX format; the visitor clicks on a highlighted number to access didactic text and close-ups in narrative order. 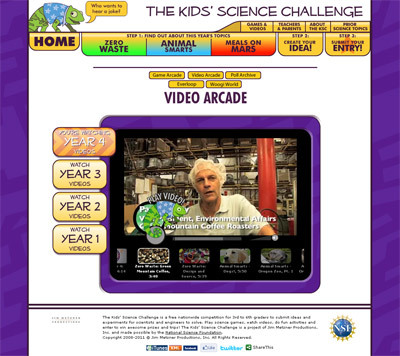 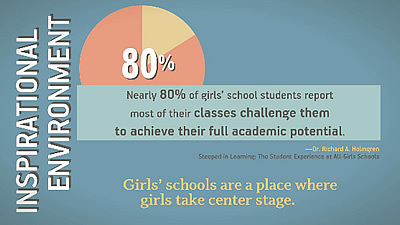 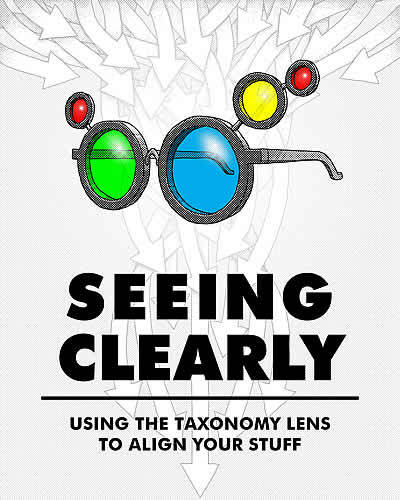 Site includes a downloadable PDF curriculum for teachers. 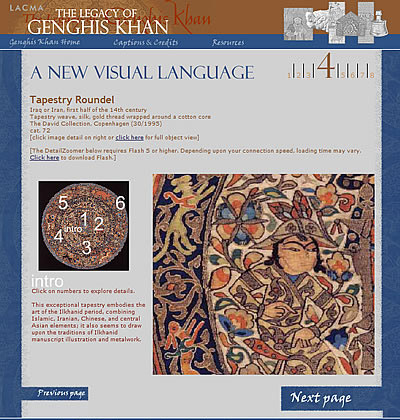 General Genghis Khan commands your presence. 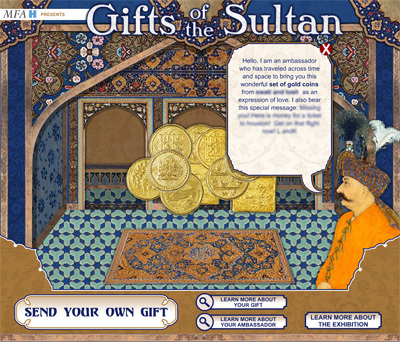 Come study Islamic Art. 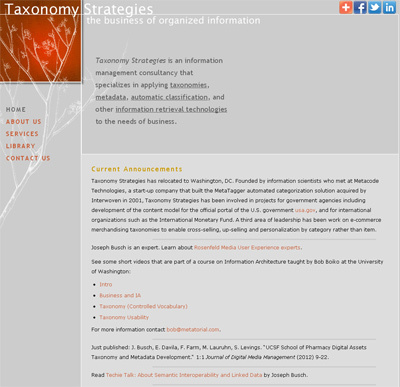 We resolved the challenge of illustrating taxonomic structure by utilizing diagrams and a timeless tree-branch visual for this custom Dreamweaver site. 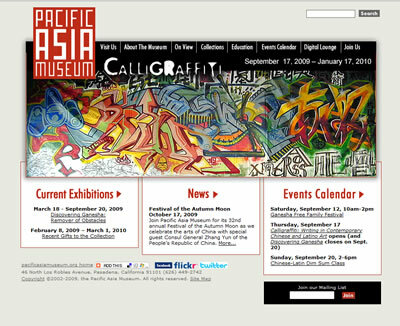 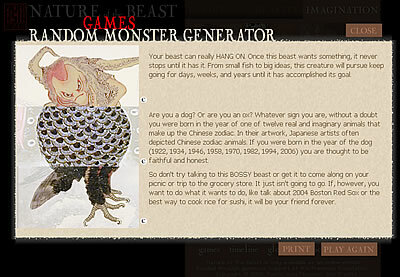 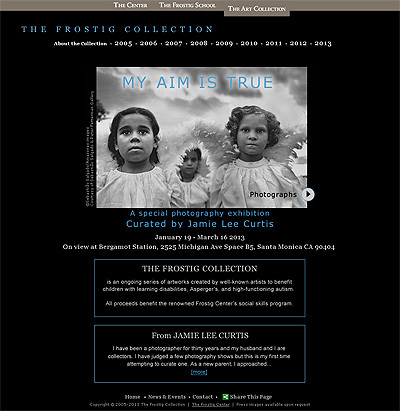 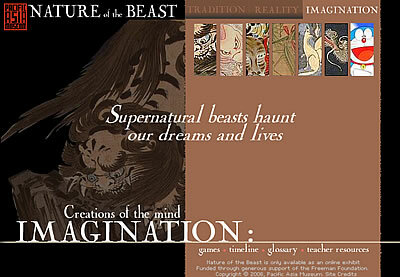 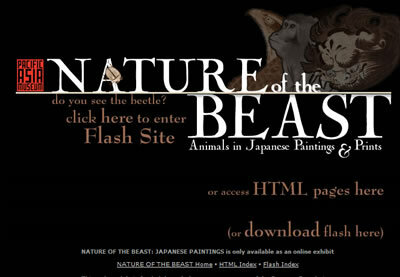 Picked as February/March 2003 Cool Art Site of the Month by the San Francisco Exploratorium! 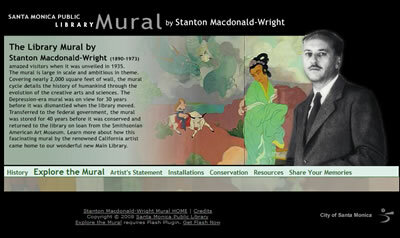 How can a place inspire an artist? 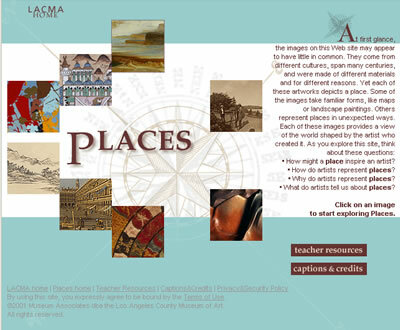 How do artists represent places? 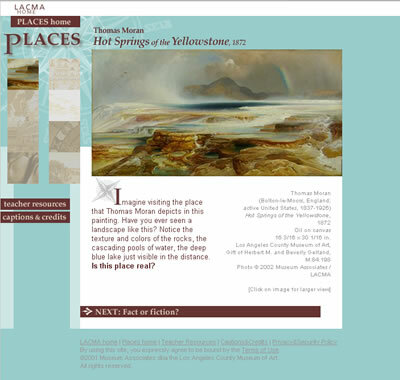 Why do artists represent places? 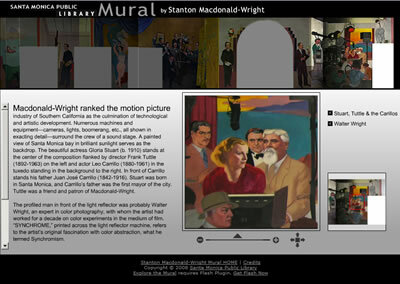 What do artists communicate about places? 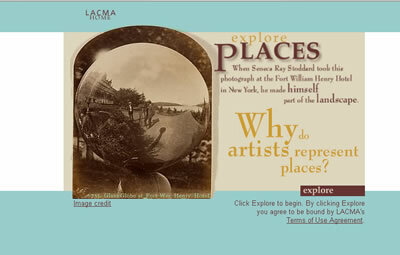 This educational module for the Los Angeles County Museum of Art presents eight works from the collection revolving around the concept of “location” and includes Flash elements, animated gifs, popup windows for object comparison, a fun Java Applet, and downloadable PDF teacher resources. 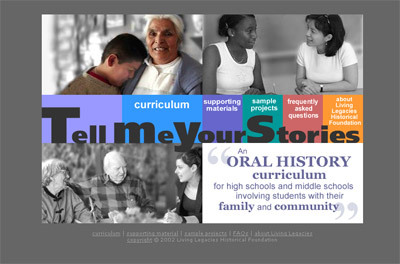 Living Legacies Historical Foundation designs curriculum for middle school and high school Social Studies/English classes, teaching intergenerational and multicultural oral history interviewing and reporting.Teacher curriculum is delivered via HTML and editable Word documents.